If you are not familiar with the terminology of the yurt you may find it helpful to use our Karakalpak Glossary and Anatomy of the Yurt. The esikqas typifies Karakalpak all-pile weaving. The esikqas is a small, purely decorative, carpet which was placed inside the yurt above the door. It was located behind the uwıqs, directly above the qızıl basqur and aligned horizontally with the aq basqur. As such it concealed the end fastenings of the aq basqur. A pair of ishki janbaw were arranged symmetrically on each side of the esikqas, one end sewn to each side of the esikqas, the other tied to the kerege bas on the side of the yurt. Together they formed a pair of decorative garlands framing each side of the exit. 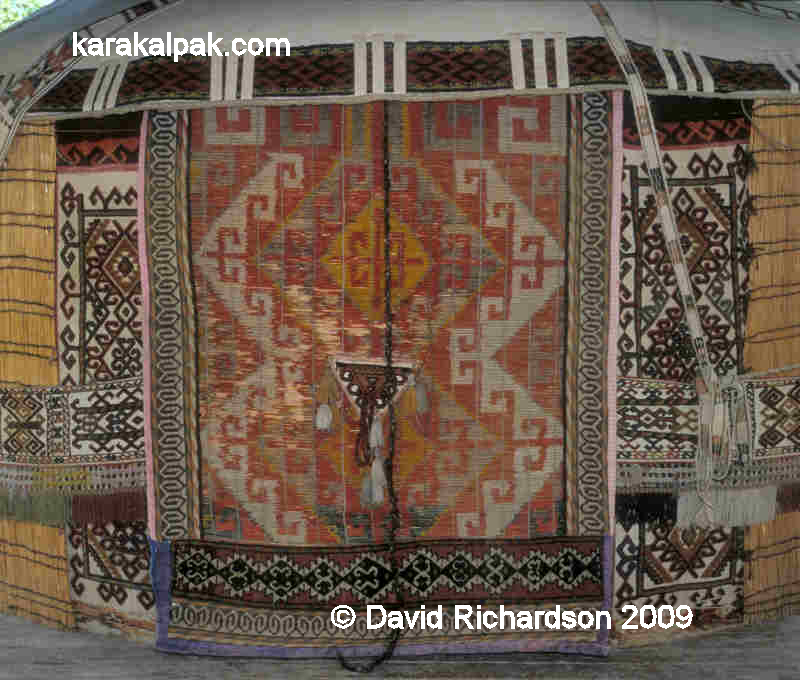 A typical Karakalpak esikqas sits above the door of a simple yurt at Sarı Altın in 2007.
waist belt but no aq basqur. A qızıl qur links the shan'araq to the lattice walls. Almost two thirds of esikqas are woven in the twelve horns or on eki mu'yiz pattern, pictured above. 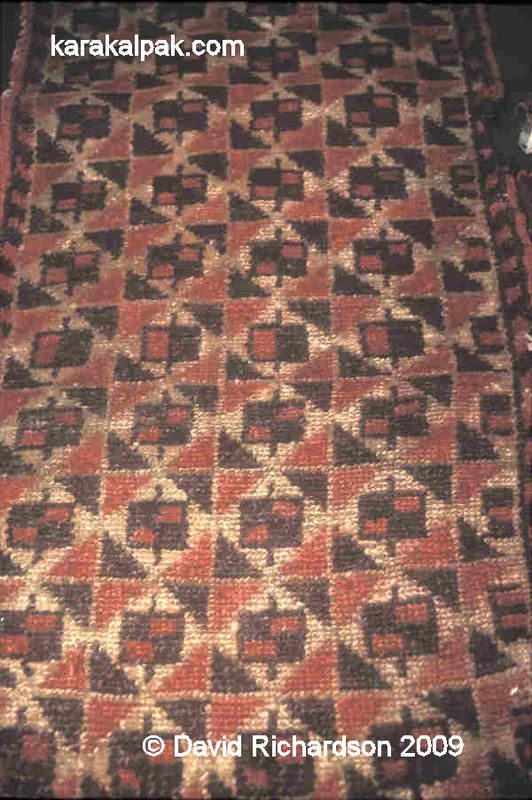 A handful of other designs were also woven but are much less common. Today it is extremely rare to find a esikqas decorating the interior of a Karakalpak summer yurt. The esikqas plays no structural role in the architecture of the yurt and most seem to have been sold off over the past 20 years for much needed cash. did not have a traditional esikqas to decorate the door. Today most yurts lack any internal door decoration. A few use some other decorative item, such as a rectangle of appliqué or even a qarshın. In the example shown above the owner has used a modern rug celebrating the 100th anniversary of To'rtku'l. There is no ishki janbaw. A modern sırtqı janbaw-like tent band has been incorrectly placed below the modern rug instead. 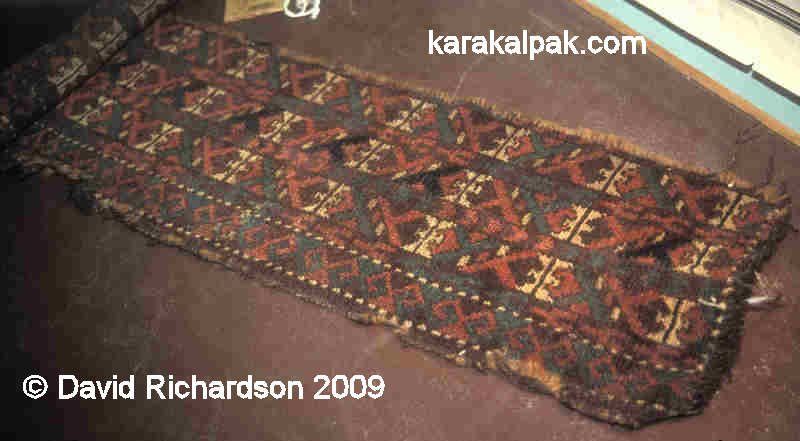 In the past much confusion has arisen among carpet scholars concerning the difference between Karakalpak qarshıns and esikqas and published examples have been frequently mislabelled. For example the late George O'Bannon did not have the confidence to correctly label a Karakalpak qarshın, mistakenly described by the Decorative Arts Museum in Tashkent as a esikqas, even though he recognized that it lacked the on eki mu'yiz motifs found on other esikqas and was decorated with the qarshın motif instead � see his published translation of Moskova's "Carpets of the Peoples of Central Asia", Figure 43. In Karakalpak Cyrillic есик, transliterated esik, means door while қас, transliterated qas, means brow or eyebrow, so the есикқас or esikqas is literally the brow of the door, a very appropriate description. It is pronounced yesikqas. Note that when the Karakalpak letter "е" appears at the front of a word although it is transliterated as "e", when spoken in Karakalpak it sounds like "ye". The "к" sounds like the English "k" in "click", while the "қ" with a descending tail is pronounced like "ka" or the "c" in "car". Because most of the literature on Karakalpak material culture is in Russian, most English authors have adopted the incorrect expression esik kas (or worse eshik or essik kas), which is actually a transliteration of the Russian word есиккас, spelt with the normal Cyrillic "к". The esikqas is closely associated with a pair of decorative tent bands known as the ishki janbaw, ishki meaning internal. The word baw, often expressed as baw shuw, is the generic Karakalpak name for a tent band. The prefix jan denotes angled or sloping and is a reference to the fact that janbaw tent bands are hung at an angle in the form of a sloping garland. The Karakalpaks traditionally used the Arabic script, the language of the Qu'ran, but in 1928 were forced to adopt the Latin alphabet instead. The Russian Cyrillic alphabet was imposed upon them in 1940 as a means of uniting the peoples of the USSR and of promoting the teaching of Russian. Certain additional letters were included to cope with certain Karakalpak phonetics. Even so Cyrillic has never really been appropriate for many Karakalpak words. We have attempted to use the correct English transliteration for all of the Karakalpak words used on this page. For further details see Karakalpak Glossary and Karakalpak Language. Note that esik also means door or gate in Qazaq while eshik means the same in Uzbek. The Turkmen use either işık or gapy. However in some other Turkic languages, such as Anatolian, eşik means threshold. In Karakalpak (and Qazaq) the word for threshold is bosag'a, while the Uzbeks use bo'sag'a or ostona and the Turkmen use bosaga. 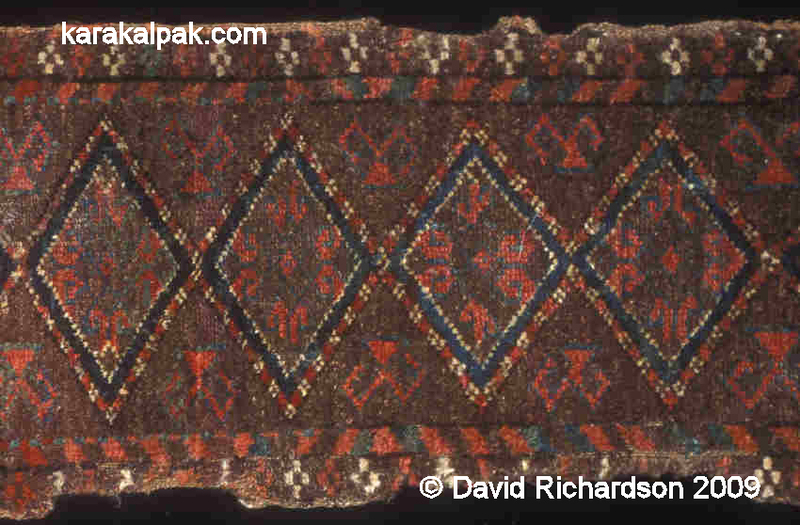 The esikqas is a small rectangular carpet with a knotted woollen pile. Its average dimensions, based on a statistical sample of 25, are 112cm by 33cm. However lengths vary from 99 to 126cm and widths fall into two types � narrow (32 to 33cm) and wide (36 to 37cm). The esikqas is therefore roughly similar in size to the average Karakalpak qarshın bag face, although the latter seem to occur in a wider variety of sizes - bag faces range in length from 90 to 130cm and in width from 25 to 36cm. Some can be very long and thin, while a minority are short and wide. A typical Karakalpak esikqas with the on eki mu'yiz pattern. Richardson Collection, early 20th century. To the Western eye the role of the esikqas appears to have been entirely decorative but to Karakalpaks it may also have played a spiritually protective role, defending the occupants of the yurt from the harmful forces of the external world. Ram's and goat horns have long been assumed to have amuletic powers and even today some Karakalpaks mount a pair of ram's horns above the entrance to their homes, while farmers place rams heads on poles next to their fields to protect their crops. 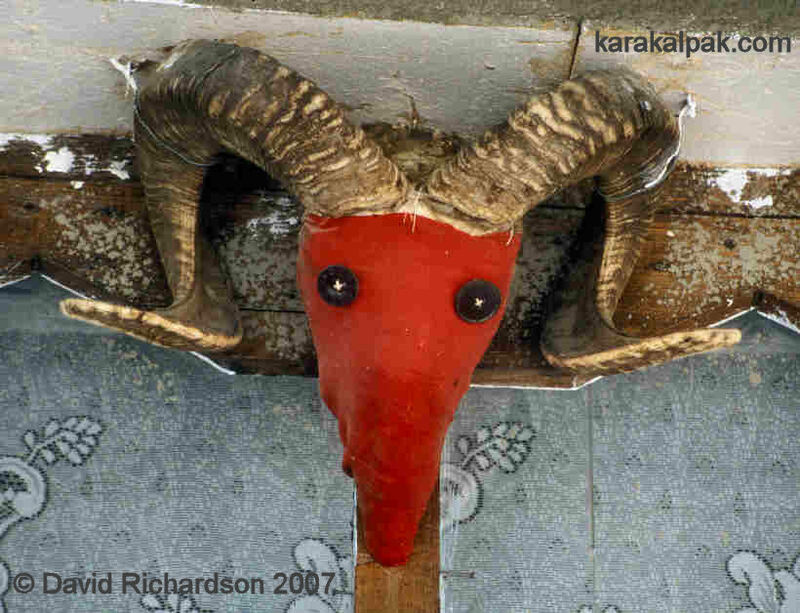 A ram's skull provides amuletic protection to a house in a suburb of No'kis. The esikqas is located inside the yurt, oriented horizontally in alignment with the aq basqur and sitting above the qızıl basqur, the lower edge of which is located just above the door lintel or man'laysha. Just like the aq basqur and the qızıl basqur, the esikqas sits behind the wooden uwıqs and in front of the aldıng'ı u'zik, the front felt covering of the roof. The aq basqur is woven so that its decorative panels stretch around the yurt from the line above the tulg'a or upright door jamb on one side of the door, to the line above the tulg'a on the other side of the door. As such it decorates the complete inner circumference of the yurt, apart from the space above the door where its ends are tied. Without the esikqas one would simply see the untidy mess of knotted aq basqur ends criss-crossing above the door. The aq basqur is the most important decorative item within the yurt and the esikqas not only conceals its loose ends but maintains the continuation of the decorative theme across the top of the door. Note that the qızıl basqur is tied in a completely different way. If the to'r of the yurt is positioned at noon and the entrance at 6 o'clock, the qızıl basqur is normally wound so that its ends overlap neatly at around 2 o'clock. This means that it decorates the space directly above the yurt door below the esikqas and the highly visible area facing the door normally decorated with the crossed qızıl qurs. The esikqas is further highlighted by the addition of decorative ishki or inner janbaw on each side, which draw the eye towards the esikqas turning it into a central point of focus directly opposite the place of honour or to'r. The ishki janbaw are a narrower version of the outer or sırtqı janbaw that are suspended outside the yurt on either side of the door entrance. They are woven on white cotton warps using a white cotton weft and are decorated with a woollen symmetrically knotted pile in what is called "combination technique", just like the aq basqur, with only part of the cotton ground being covered by the decorative pile. Just like its wider outside neighbour, the lower edge of the ishki janbaw is decorated with a fringe of small red and dark brown tassels. One end of each janbaw is sewn to the lateral sides of the esikqas, while the other is tied to a lower section of the uwıqs on either side or to the keregebas. As such they form a decorative garland on each side of the door. Drawing of the arrangement of the esikqas and ishki janbaw from Zhdanko, 1954. 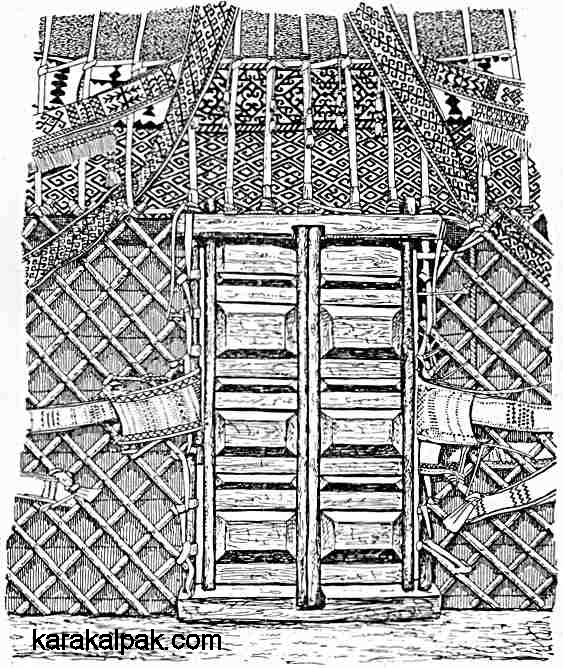 As can be seen from Zhanko's drawing, the top of the man'laysha in a Karakalpak yurt is usually about the same height as the kerege, or just a little bit taller. Consequently the uwıqs that go above the door are either the same length as all the others or just a little bit shorter. Therefore the qızıl basqur is positioned at the bottom of the uwıqs and just above the door. Note that the vertical qızıl qur bands suspended from the shan'araq are not always present. However in some yurts four lengths of qur, either qızıl qur and/or so-called Turkmen nag'ıs qur, are looped around the edge of the shan'araq and are suspended with their ends tied to the kerege walls, thus providing the yurt with enhanced stability. In such a situation one of the four qurs is draped on either side of the esikqas creating an additional element of decoration around the door. Occasionally long red and black tassels are sewn along the bottom of the esikqas, so that they hang down over the upper part of the door entrance. in the fund of the Russian Ethnography Museum, Saint Petersburg. Inventory number 8762-22811. In rare cases an esikqas is found with a lower decorative fringe similar to that found on kergi storage bags. A wonderful shaxmax-patterned esikqas with a lower decorative fringe and tassels. From the State Museum of Art named after Savitsky, inventory number 4886. Jon Thompson found it very hard to accept that esikqas were placed behind the uwıqs or even that they were actually called "esik kas" [sic] in the first place, getting himself in an awful muddle as a result. His analysis was not helped by the fact that he was not using a esikqas as a reference point, but rather another small weaving (roughly half of the width of a traditional esikqas) decorated with three on eki mu'yiz motifs. 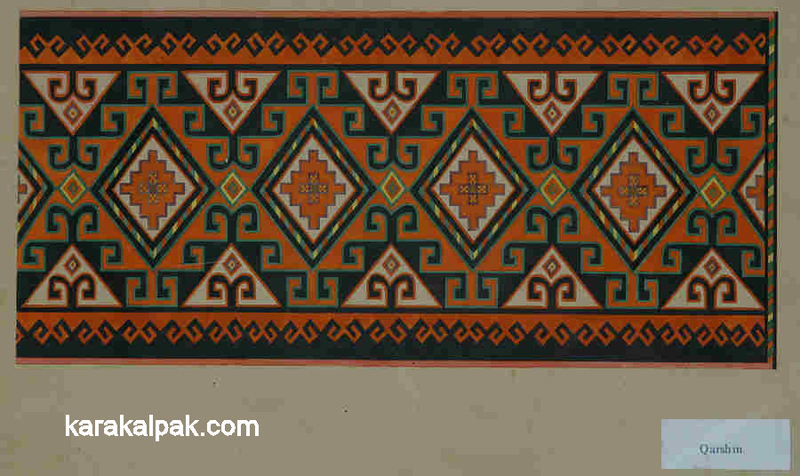 In the 1920s and 1930s this motif was adopted for use in small, irregularly sized rectangular all-pile weavings and even in large rugs and carpets, none of which were ever traditional Karakalpak items. 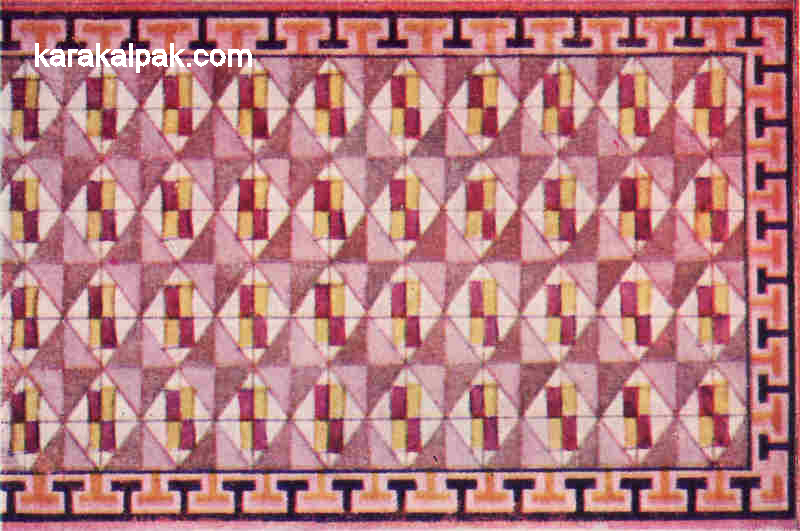 The way in which these smaller weavings were used is unknown � they may have been purely decorative. The small Karakalpak all-pile carpet exhibited in the Hajji Baba exhibition "Timbuktu to Tibet". The colour palette suggests that it was possibly made in the late 1920s or 1930s. Thompson suggested that the function of the esikqas as a decoration above the yurt door was a secondary one that had been adopted "after the effective death of Karakalpak nomadic culture". Incorrectly interpreting the meaning of qas he went on to propose that its original purpose was related to the threshold ("esik") and curvature ("kas"), concluding that the small rectangular rug may have been the face of a cushion that was used to decorate the front of the bedding stack, or hung as a hat rack above the yurt door. We are not helped by the complete absence of detailed historical information describing all aspects of the the interiors of Karakalpak yurts in or before the 19th century. Although Baron Aleksandr Kaulbars left us a comprehensive description of Karakalpak life in 1873 he did not describe the interior of the yurt in complete detail and made no reference to anything resembling a esikqas. Most of our current information comes from Soviet ethnographers who began to study Karakalpak material culture from 1926 onwards. Part of their approach was to interview elderly Karakalpaks, recording their memories of what things were like in the last quarter of the 19th century and in some cases even earlier. There was universal agreement from these sources that the esikqas was always placed behind the uwıqs above the door. "A small 'esik kas' rug is fastened horizontally above the door". She made reference to two photographs taken by Aleksandr Melkov in 1928/29 (inventory numbers 68 and 94), which we have yet to locate. "Above the doors inside the yurt, between the 'uyks' [uwıqs] of the ceiling and the felt, is placed the rug 'esik-kas' (Plate 38), the pattern of which is regularly uniform, apart from insignificant variations in the border, for all localities and tribes of Karakalpaks in the regions of interest to us. To the ends of the esik-kas are fastened two 'ishki zhambau' � of smaller sizes than the external zhambau, but also decorated with a fringe with tassels." Plate 38 is reproduced a little further down. During the same period Zhdanko's team studied the way of life in the Axunbabaeva kolxoz located in the district of Ken'es, north of Shımbay. By 1949 the 214 households of the village all spent the winter in single-storey houses or tams rather than yurts. However with a few rare exceptions every household still kept its own yurt and Zhdanko noted that these were decorated with carpet articles such as the esikqas and qarshın. "The second type of Karakalpak piled carpet - 'esik-kas' - is almost the same size as the karshin. Its purpose - is to decorate the entrance of the yurt inside; the esik-kas is passed between the poles of the yurt dome and its felt casing, directly above the doors. On the lateral sides to it, as was indicated above, are sewn the white decorative strips, ishki zhambau,with a relief pattern and a fringe. (Figure 4). The design of the esik-kas has less variants than the design of the karshin. The most widespread and generally used design is shown in Table IV, 4. It consists of a series of connected octagonal medallions with rhombuses inscribed inside. The field between the light yellow and ochre edging of the rhombuses and the octagons is filled with stepped and symmetrically arranged pairs of muyiz, which fill the background of the octagonal medallion and give the esik-kas its light colouring. In the centre of the inside rhombuses there is a design made from two pairs of muyizes, with rolling red horns, facing away from each other." According to Zhdanko, the most widespread and generally used design of esikqas. Item 4 in Table IV from B. V. Andrianov and A. S. Melkov, 1958. In the same year of 1958 a combined group of ethnographers from the Khorezm Expedition and the Academy of Sciences working under Tatyana Zhdanko investigated the Karakalpaks living along the southern shore of the Aral Sea. After visiting the Moynaq peninsula they went on to explore the five islands of Qarabaylı, Aqpetki, Taylaqjiten, Tasbesqum and Mergenataw, which were seasonally inhabited by Mu'yten Karakalpaks and Qazaqs belonging to the Alim tribe. The latter two groups lived closely together and frequently intermarried. Both were still actively involved in tent band weaving and continued to use the yurt as a domestic dwelling, especially during the hot summer months. Zhdanko noted that the Mu'yten Karakalpaks, who belonged to the Qon'ırat arıs, placed a esikqas above the door on the inside of the yurt. Two tent bands, which she described as iinbau, were then attached to its lateral sides. Her iinbau [iyinbaw in Karakalpak, iyin meaning shoulder] were undoubtedly a pair of ishki janbaw. By contrast she noted that the Alim Qazaqs did not use a esikqas, but as an alternative decoration stretched an iinbau horizontally above the top of the door. The word iyin refers to the bend or shoulder in the uwıqs � the location of the esikqas. The Karakalpaks sometimes use the phrase iyinbaw in place of ishki janbaw. Zhdanko noted that the "elegant" iinbau had a complex fringe and bore the names of the relatives of the tent band weaver. The Karakalpaks frequently incorporated family names in their tent bands. "Since a separate carpet decoration (esikqas) is placed above the door, the decoration of the aq basqur is arranged so that the first and last elements of the belt are in line with the struts of the door � the tulg'a." "This complex decoration [the aq basqur] is extended above the entrance inside the yurt. It consists of three parts. In the middle - the rectangular rug esikqas - across the width of the door, and sewn to the lateral sides of the rug two narrow symmetrical runners, decorated with napped ornament on the white warp. The lower edge of the ishki janbaw is decorated with small tassels or a long fringe. The esikqas carpet above the door overlaps the clearance between the ends of the aqbasqur, as a result of which the aqbasqur ornamental belt achieves its logical completion. Artistic accent is emphasized even though the aqbasqur is viewed behind the uyıqs, and the ornament of the ishki janbaw is completely 'read', since it is superimposed from within above the kerege." "Patterned janbaw extend along the sides of the door; at the ends they have long laces with tassels, with the aid of which they are attached to the heads of the kerege of the yurt. The general name of this rug with wings - ishki janbaw. The name of the rug esikqas literally indicates the 'brow of the door'." Although Ludmilla Beresneva published some comments on esikqas held in the State Museum of Oriental Art in Moscow in 1984, this was purely a museum study based on the limited collection of 54 carpet items assembled by Igor Savitsky in 1958. Beresneva had only just joined the museum and this was her first project. She never visited Karakalpakstan and with only the limited information published by Zhdanko and Morozova as a reference she noted that her study was made difficult by the lack of any specialist literature on Karakalpak textiles. Not fully equipped to distinguish between qarshıns and esikqas, she was forced to rely completely on Savitsky's descriptions. These were broadly correct but did include a handful of anomalies. An English translation of Beresneva's booklet appeared a decade later in the 1995 Oriental Rug Review. For a better understanding of Karakalpak qarshıns click here. "The qızıl basqur is placed at the level at which the face side of the shoulders of the uyıqs bend towards the inside of the yurt, fastening the bottom of the arcs and the upper edge of the lattice. Above it on the ceiling of the yurt is placed the aq basqur with its face side inward, thus strengthening the cupola of the yurt." "These carpet objects (i.e. the qızıl basqur and the aq basqur) are stretched along the bottom of the cupola from right to left so that their knots are hidden. This is achieved by means of the special carpet article � the esikqas (brow of the door) - which is fastened above the door of the yurt so that any person who has entered the yurt gains the impression that they are in the centre of the universe. This impression appears not only from the fact that the main fastening of the aq basqur and qızıl basqur is not evident (it is hidden by the esikqas), but from the fact that, in the determined order, they are richly ornamented by the images of flora and fauna, the planets in space and other natural phenomena." Note that Tlewbergenova mistakenly assumed that the qızıl basqur was tied in exactly the same manner as the aq basqur. The esikqas is only wide enough to conceal the tied end cords of the aq basqur. For this reason the ends of the qızıl basqur are tied differently and in another location. We should end this part of the discussion by adding that we too have probably interviewed around one hundred elderly Karakalpaks over the past decade and have never been given any indication of any alternative arrangement of the aq basqur, esikqas, and ishki janbaw. All of this information indicates that the arrangement of the internal (and the external) decoration of the Karakalpak yurt has remained remarkably uniform and stable throughout Karakalpakia both in the closing decades of the 19th century and in the first decades of the 20th century, before the traditional semi-nomadic culture of the Karakalpaks was swept away by the Soviet modernization in the 1930s and 1940s. There are some historical references to support this view. 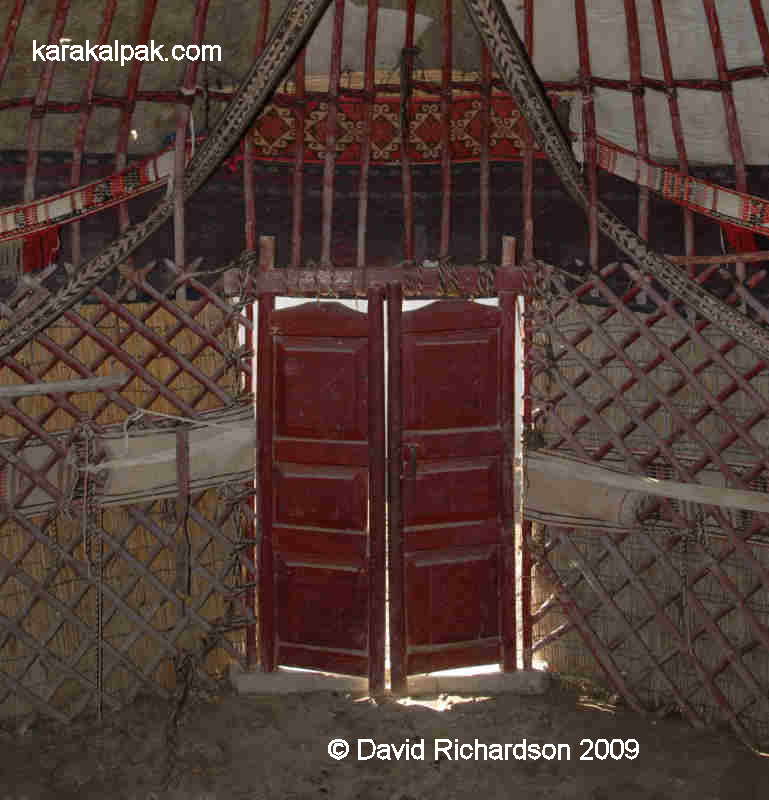 For example Baron Kaulbars noted in 1873 how the Karakalpaks fastened the felts to the roof and kerege lattice walls of the yurt using quite wide white woollen bands, which cross the roof and kerege in different directions � a method quite different from that used by the Qazaqs. In 1901 Girshfeld and Galkin reported that the yurts of rich [Karakalpak] nomads were covered outside by narrow woven strips, which held down the felt, whereas the tents of the paupers were fastened with normal camel ropes. However it is likely that the origin of the esikqas goes back much further than the 1870s. 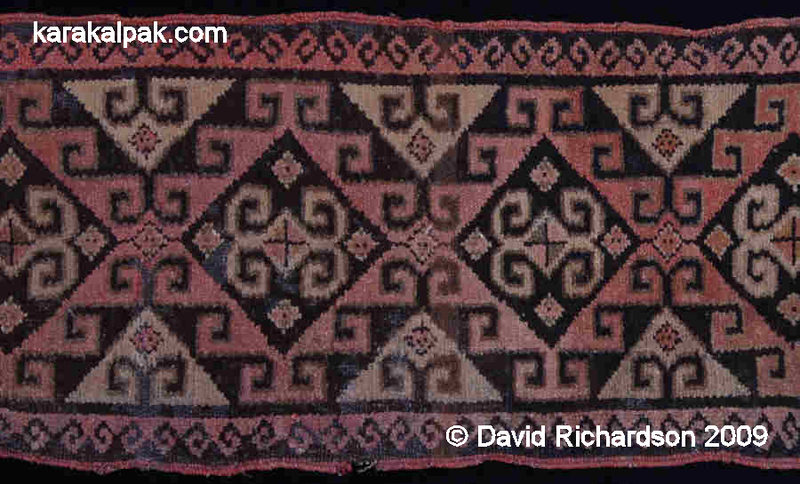 The discovery of a similar rug with an identical pattern to the esikqas woven by the Karakalpaks of the Aral delta among the Karakalpaks of the Samarkand region by E. R. Schneider (quoted by Zhdanko, 1958) means that it is highly probable that the design dates back to the time before the two populations split from each other. The main phase of Karakalpak immigration into the Zeravshan region took place following the devastating Jungar raids along the Syr Darya in 1723. More may have followed in the early 19th century, escaping from subjugation by the Khivan Khan. This suggests the esikqas carpet may have been in existence as far back as the early 18th century, although we obviously have no knowledge of how it was used at that time. Esikqas have their own distinctive range of patterns which are quite different from those that are found on qarshıns. 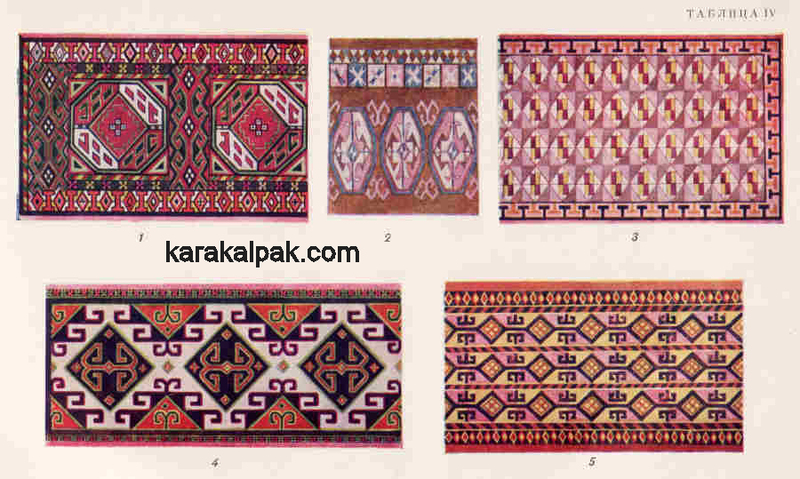 The key question is why the Karakalpaks have these two sets of small carpet items, which are identical in terms of size and structure but are different in terms of decoration and usage. Did the esikqas originate as just another type of bag face that somehow ended up as a decoration above the yurt door? 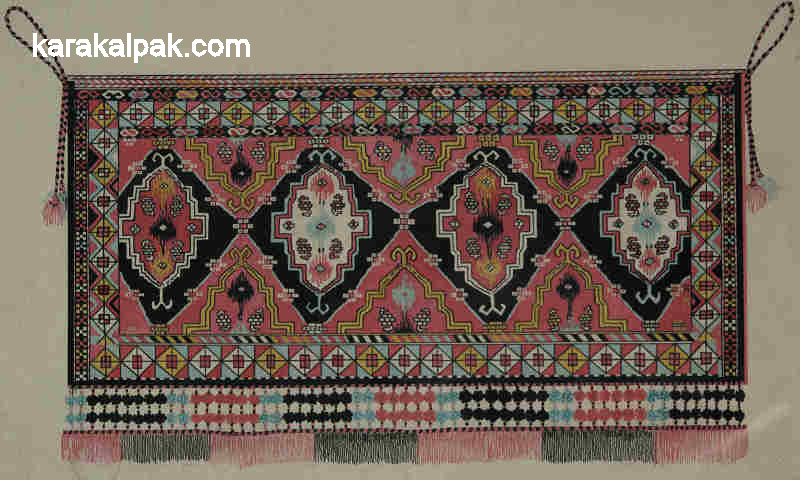 A related question is whether the Karakalpak aq basqur � woven with plentiful cotton and decorated with its many Turkmen nag'ıs patterns - is traditional or whether it was copied from Turkmen nomads living at the edges of the Aral delta after the majority of Karakalpaks migrated into the region in the late 18th and early 19th centuries? The answer is that we simply do not know. From what we understand of past trends in Karakalpak material culture there seem to be long periods of stability during which fashions changed very gradually, interspersed by short periods of dramatic change � for example the introduction of the qızıI kiymeshek wedding costume at the turn of the 19th century. It is possible that the decoration of the yurt evolved through a similar process with the sudden wide-scale adoption of a popular new fashion. Having identified a clear distinction between esikqas and qarshıns we now need to complicate matters by noting that one does occasionally come across exceptions - an esikqas is used as the face for a qarshın bag or else a qarshın bag face is placed above a yurt door. In some cases such situations arise from necessity in an age where traditional prescriptions no longer apply � if the yurt no longer has its esikqas then a qarshın will have to be used in its place. However it is clear that some of these functional crossovers go back at least to the 1920s when Melkov was studying Karakalpak yurts and their decoration. Melkov not only collected a complete yurt and examples of yurt decorations but also recorded images, firstly in the form of an album of black and white photographs and secondly in the form of coloured paintings. Of the limited collection of paintings held in the Regional Studies Museum, No'kis, there is one of an on eki mu'yiz esikqas, which has clearly been labelled as a qarshın. Melkov's 1928-29 painting of a esikqas, which he labelled as a qarshın. Courtesy of the Regional Studies Museum, No'kis, inventory number 2059/26. Fortunately a selection of some of the paintings executed by Boris Vasilyevich Andrianov for Melkov at that time are reproduced in Zhdanko's 1952 and 1958 articles. Plate 38 from Zhdanko, 1952, painted by Boris Andrianov. Items 1,2,3, and 4 are labelled as qarshıns, while 5 is described as an esikqas. 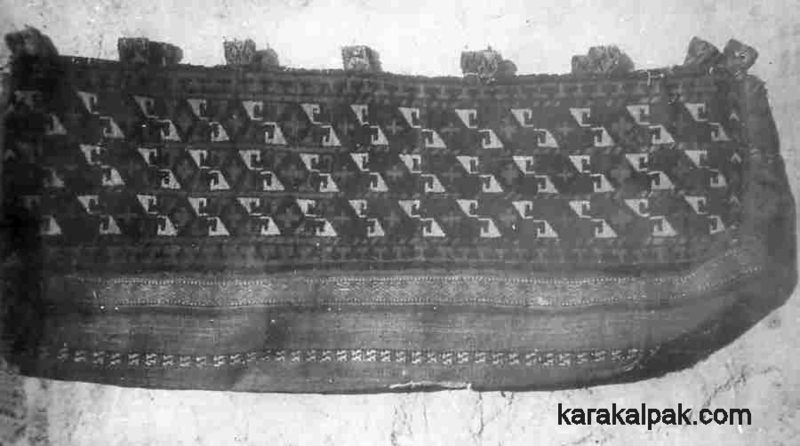 Plate 38 (1952) shows five small Karakalpak weavings, out of which the one esikqas (the second weaving from the top) is labelled as a qarshın, while the bottom tikesh nag'ıs qarshın is labelled an esikqas. Zhdanko referred to the same or a similar esikqas from Kegeyli region in her 1958 article, which she described as a taraq (comb) pattern rather than tikesh (bread stamp). She noted that the design was identical to that on a kergi storage bag sketched by Melkov in the same location. Table IV from Andrianov and Melkov, 1958. Items 1, 2, 3, and 5 are labelled as qarshıns and item 4 is labelled an esikqas. Andrianov and Melkov's Table IV, to which Zhdanko referred, shows five more weavings, collected between 1946 and 1948, of which three are actually esikqas (items 3, 4, and 5) and two are qarshıns (items 1 and 2). The on eki mu'yiz esikqas (item 4) is correctly labelled as an esikqas, but the two rarer patterns � shaxmax and az mu'yiz (items 3 and 5) � are labelled as qarshıns. One possibility is that Melkov's team did not yet fully understand the division between the two types of weavings. The esikqas correctly labelled in Table IV (item 4) was collected from "Kyzyl-asher" State Farm in Moynaq region in 1946. It appears to be exactly the same weaving illustrated some six years earlier in Plate 38 (item 2), when it was described as a qarshın! Clearly the early ethnographers were confused about the distinction between these two carpet types. However this cannot be the full story. 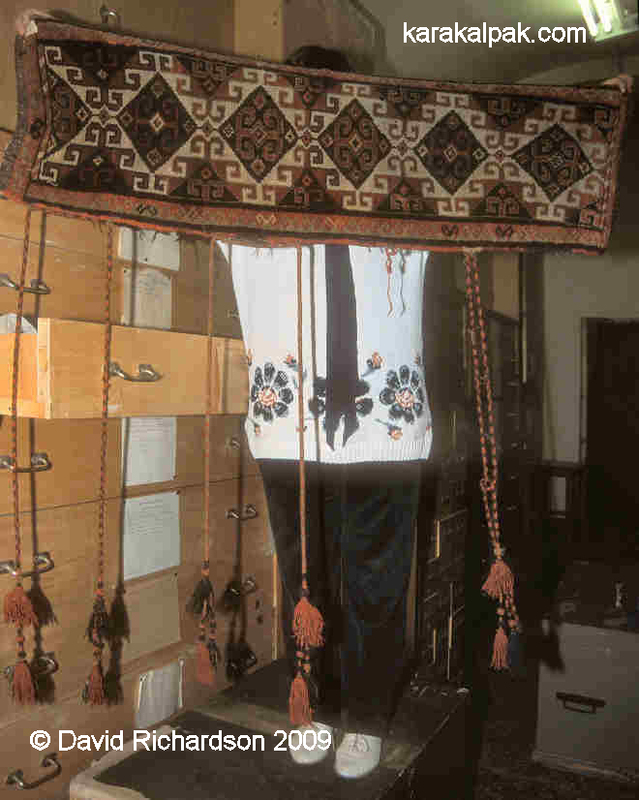 One of Melkov's own photographs shows a complete qarshın bag made with an az mu'yiz esikqas. Clearly even in the late 1920s the Karakalpaks themselves were occasionally confusing the roles of qarshıns and esikqas. Melkov's qarshın with the az mu'yiz design, photographed in 1928-29. Courtesy of the Karakalpak Branch of the Uzbek Academy of Sciences, No'kis. One further high-profile example is a complete qarshın bag with an on eki mu'yiz esikqas face held in the collection of the Russian Ethnography Museum in Saint Petersburg (inventory number 5111-138, where the number 5 shows that it was acquired earlier from a museum in Moscow). It is possible that this was one of the 86 items collected by Melkov in the late 1920s that was subsequently sent to the Fund of the Moscow Museum of the Peoples of the USSR by the government of the Karakalpak ASSR in 1933, presumably in recognition of its recently enhanced status and incorporation into the Russian SFSR. A qarshın storage bag with the on eki mu'yiz design normally associated with esikqas. Russian Ethnography Museum, Saint Petersburg, inventory number 5111-138. A few more examples can be found among the collection of Karakalpak carpet wares held by the Museum of Oriental Art in Moscow. As already mentioned, this was assembled by Igor Savitsky in the Kegeyli region during 1958. It contains 29 items that Savitsky listed as qarshıns, two of which are strictly esikqas (1612 and 4313), and 14 items listed as esikqas, two of which are qarshıns (4284 and 4312), and one of which is a few lengths of tent band sewn onto the sides of an external shiy o'n'ir door decoration to create a small rug or pallas (4289). Of the three az mu'yiz esikqas in the collection, two are labelled correctly but one is listed as a qarshın. Do these examples show that clearly defined Karakalpak prescriptions related to the specific roles of cultural artefacts were already beginning to break down under the influence of the Soviets in the late 1920s? Or was such a crossover of roles more long-standing, possibly reflecting an earlier time when esikqas patterns more commonly occurred on qarshın bag faces? The weavings collected and photographed by Melkov in 1928-29 were probably made in the late 19th or early 20th century, and show that the crossover in roles must have been a long-standing feature of the traditional material culture of the Karakalpaks of the Aral delta. Furthermore when a reversal in roles is noted it is generally the case that esikqas are used or labelled as qarshıns � the use of qarshıns as esikqas is far less common. We must also remember that Communism was slow to reach Karakalpakstan. It only became an Autonomous Oblast of Kazakhstan in 1925, where it was effectively ignored until Moscow demanded its transfer to the Russian Federation in 1930. The most likely explanation is that the esikqas originally evolved from a qarshın bag face. The on eki mu'yiz pattern, probably associated with the Qon'ırat arıs, became the most popular esikqas, while the more geometric and Turkmen-inspired az mu'yiz, shaxmax, and qıyıq na'gis patterns, possibly initially associated with the On To'rt Urıw, became speciality esikqas. As the fashion for esikqas took hold, these four patterns became increasingly rare as decorations for bag faces. However a minority of Karakalpaks preferred to carry on making the old styles of qarshıns, giving rise to the exceptions that we see today. Decorative door carpets are also found among some of the other Turkic groups inhabiting Central Asia, but none seem to be as universally widespread as the Karakalpak esikqas. Their role was partly decorative, partly protective, and in some cases eminently practical by covering the draughty gaps between the door surround and the yurt frame. 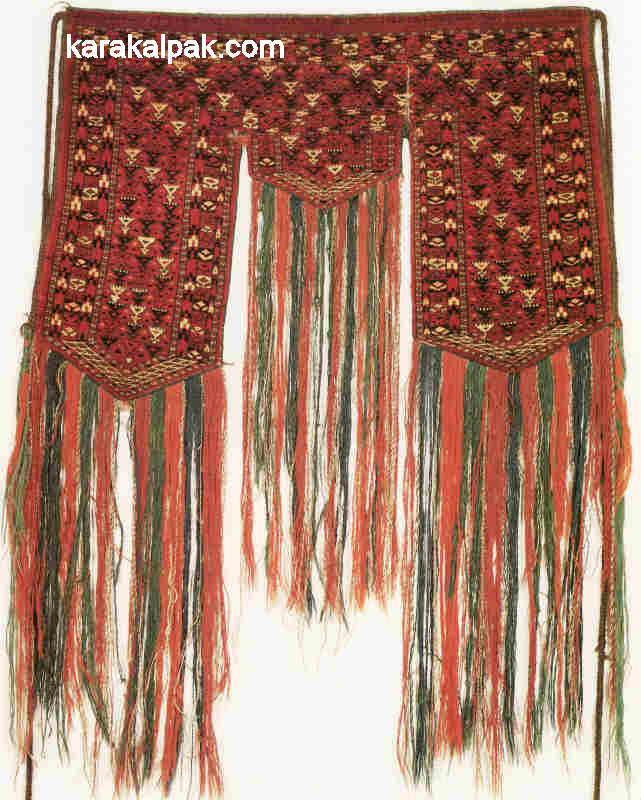 Uzbek eshik asma with fringe of net and tassels, dated 1930. Samarkand State Museum of the History of Culture and Art of the Uzbek People. 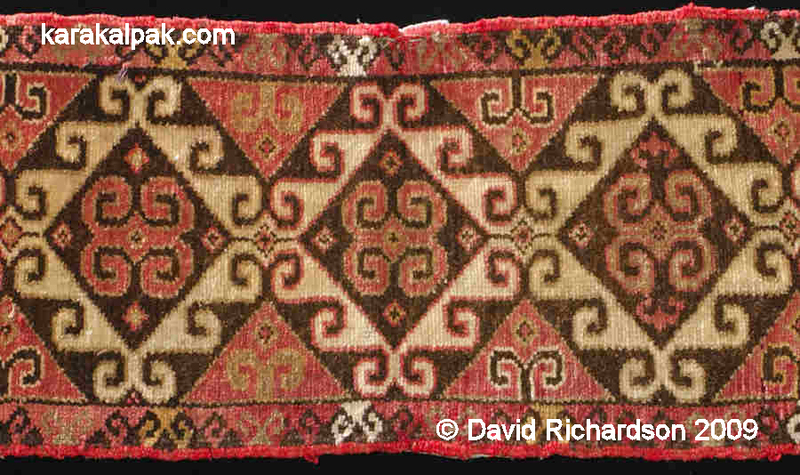 This suggests such weavings were common among the Uzbeks of the Surkhandarya region. The design is very similar to that found on Uzbek napramach and Kyrgyz chavadan bag faces and has some parallels with the on eki mu'yiz esikqas, with a row of large and small hooked concentric diamond motifs. There is a different type of Uzbek door decoration which is П-shaped like a lambrequin � one example from the Russian Ethnography Museum dated 1870-1900 is illustrated by Elena Tsareva � inventory number 36-26 shown in plate 122, 114cm by 87cm. It has also been published by Emelyanenko. Uzbek lambrequin-like yurt door decoration composed of knotted pile strips. Russian Museum of Ethnography, inventory number 36-26, assigned to the late 19th century. 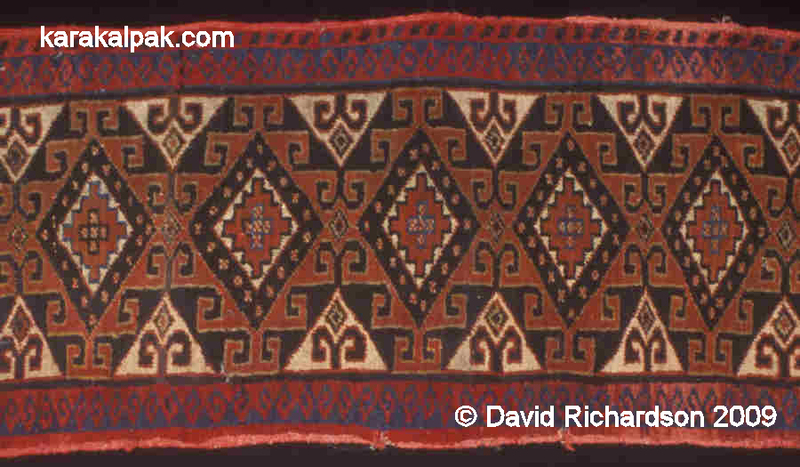 It is not clear whether similar weavings were ever used by the Uzbeks living in the Khorezm oasis and the Aral Delta. The Uzbeks settled into permanent dwellings long before the Karakalpaks and the Turkmen, so the opportunity to conduct field studies of their yurts has been limited. In 1826 G. Gelmersen observed that only the Qongrat Uzbeks living in the Aral delta still maintained their traditional nomadic lifestyle. The Uzbeks of the southern regions of the Khivan Khanate had already settled in houses and only used their yurts in the summer time. By 1873, according to G. I. Danilevskiy, very few of the Uzbeks living in the Aral Delta still conducted a nomadic existence. Baron Kaulbars found that the Aral Uzbeks, who prior to 1873 had lived in felt kibitkas within their fenced gardens, had now constructed durable mud dwellings alongside them. Even so by the late 1940s most of the Aral Uzbeks living in the Qon'ırat region of the Aral Delta still kept a yurt in the yard close to their dwelling. These people were studied in 1946 by the ethnographer Klavdiya Zadykhina, who had studied the Qazaqs before the war and had been briefly assigned to the Khorezm Expedition. Her findings were published in 1952. The Aral Uzbek yurts were of mainly traditional Uzbek design although Karakalpak yurts were also frequently encountered. Sadly Zadykhina failed to describe the interior decoration of these yurts, simply noting that the Uzbeks did not make their own felts or tent bands but purchased them from either the Karakalpaks or the Turkmen, and more rarely from the Qazaqs. A photograph of an Aral Uzbek yurt close to Qon'ırat taken in the 1940s appears indistinguishable from a Karakalpak yurt, with its crossed aq qurs and decorative sırtqı janbaw. This suggests that if the Aral Uzbeks ever did use a yurt door decoration it was likely to have been a Karakalpak esikqas. Kyrgyz chavadan, first half of the 20th century. State Museum of Oriental Art, Moscow, inventory number 8291, 86 by 45cm. However given the chavadan's narrow width and the fact that the weaver decorated the bag with a Turkmen pattern one wonders whether it was actually intended to be used as a storage bag. We have already seen that the Qazaqs living in close proximity to the Karakalpaks on the southern islands of the Aral Sea used a complex woven iinbau with a fringe to decorate the space above the yurt door. According to Shalekenov, the yurts of the other Qazaqs living in the lower Amu Darya were in general decorated differently from yurts of the Karakalpaks. However the Qazaqs recognized Karakalpak women for their superior skills and the diversity of their decorations. 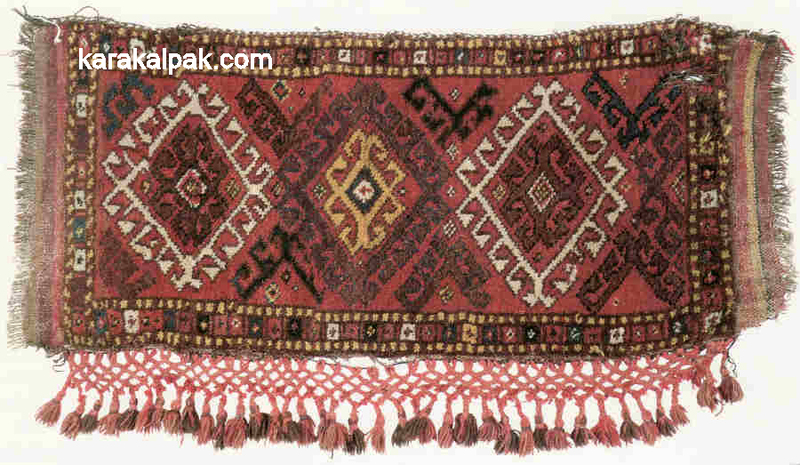 Over time Qazaq women began to adopt many of these items and weave them themselves. "Some Qazaqs purchased ... carpet articles such as aq basqurs, esikqas etc. on the market. Qazaq yurts were frequently decorated with these items." 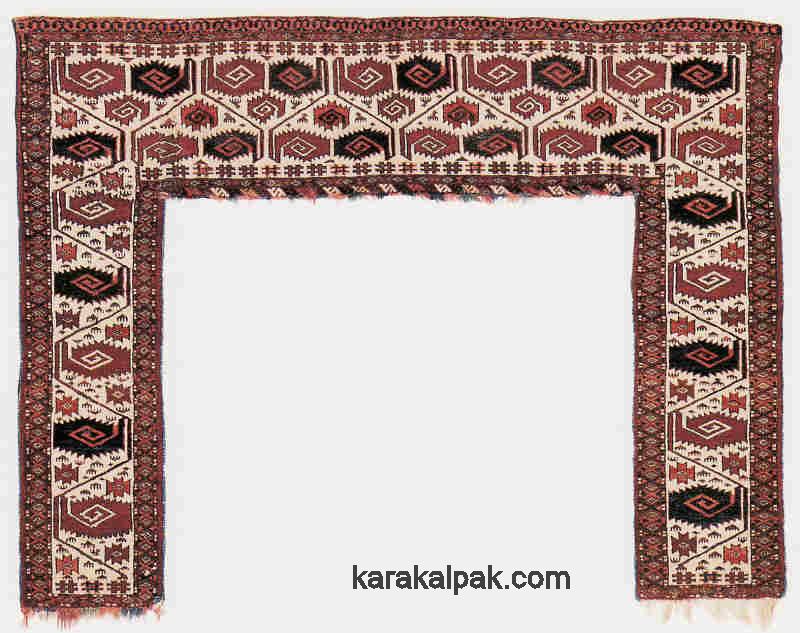 Some Turkmen tribes had an internal lambrequin-like decoration that was hung from the lintel of the door frame and was known as a gapylyk or gapy gu'llu'k, gapy being one of the Turkmen words for a door. The name is frequently wrongly transliterated as kapunyk, kapunuk, kapunnuk, or kapanuk. Tekke gapylyk decorated with the ovodan meander. Wiedersperg Collection, Fine Arts Museums of San Franscisco, inventory number 1997.142.18., 90 by 117cm. They were П-shaped and were between 104 and 120cm wide and, excluding tassels, 74 to 94cm high. They had fairly broad horizontal and vertical side sections and had either plain horizontal or triangular pointed ends. Some gapylyk, such as those woven by the Salor, had a triangular festoon on the lower side of the cross strip. Woven with a richly decorated knotted pile, the lower edges were frequently decorated with long multi-coloured fringes that were susceptible to wear and sometimes had to be replaced. The most common design incorporates the ovodan meander motif, symbolizing growth and fertility and perhaps, according to some, the infinite cycle of life itself. Gapylyks were made by the Tekke, Saryk, Salor, and Ersari, as well as by the Chodur and northern Yomut living close to the Khorezm oasis. According to Siawosch Azadi gapylyks were particularly widespread among the Ersari. Tekke khalyk, first half of the 19th century. The Rickmer's Collection, Museum für Völkerkunde, Berlin, inventory number IB 2752, 71 by 52cm. There is a similar but smaller version of the Turkmen gapylyk, the function of which is not entirely clear. Valentina Moshkova referred to it as a khalyk, supposedly meaning "little rug". Most known examples are Tekke in origin and predate the mid-19th century, although a few are Ersari. They are generally between 63 and 78cm wide and 43 to 55cm high excluding tassels, have pointed triangular ends, a triangular festoon or pendant hanging below the horizontal cross strip, and long dense fringes. Some have long cords attached to the two top corners. Both Pinner and Emelyanenko noted that they may have been used as a decoration for the front of the bride's camel in the wedding caravan and/or as a curtain over the front of her litter. Emelyanenko even claims that on arrival at the groom's yurt or house, the khalyk was placed over the top of the gapylyk with its underside facing outwards so that passers-by could judge the quality of the bride's weaving! Soviet scholars mysteriously refer to such weavings as dezlik or dizlyk, a term that is also used to describe small pentagonal camel knee decorations (dyz being Turkmen for knee). Elena Tsareva claims that in addition to being used as a collar for the leading camel of a wedding caravan they were also hung above the yurt door. Whether they were ever used as yurt door decorations is of course impossible to know in the absence of historical observations. However their width suggests they are too narrow to have been used for this purpose. Esikqas were woven on a narrow o'rmek loom, an amazingly crude contraption designed for making tent bands. As such the warps are always oriented along the full length of the carpet. Karakalpak esikqas have a very uniform and simple structure. The warps are always made from two-ply (z2s) hand-spun qılshıq � hard, shiny dark brown goat hair, sometimes mixed with a small amount of sheep's wool to create a barber's pole effect. The fibres of this goat hair appear very straight and glossy under high magnification. The two-ply (z2s) hand-spun weft used for the piled section of the esikqas is usually ginger, golden brown, or beige-coloured camel wool. The weaver begins and finishes her esikqas with short sections of plain weave using a weft of more hand-spun goat hair, either undyed or sometimes dyed red. Occasionally small sections of lighter sheep's wool or plied sheep's wool and goat hair are included to create a weft-striped effect. In some examples two, or even three, wefts are inserted into each shed, speeding up the weaving process but at the cost of creating a less durable open structure. In the completed esikqas these plain ends are folded over and stitched to form a strong hem. This stabilizes the section of knotted pile and provides an edge for attaching the ishki janbaw. The knotted section is always woven with a weft of lightly plied (z2s) camel wool. It is normal to find just one shoot of weft used between each row of knots, but sometimes one encounters two. The pile is always knotted using hand-spun sheep's wool (again z2s), usually dyed but sometimes not. The colour palette of the woollen pile varies enormously. The traditional colour combination is mainly ivory, dark brown, and brick or rust red with small amounts of beige and indigo highlighting. Unlike in qarshıns, indigo is used only sparingly in most esikqas. In fact some esikqas contain no indigo at all. The one exception is the qıyıq nag'ıs version where indigo is used extensively. The availability of chemical dyes led to a major change in the appearance of esikqas, with the reds becoming much harsher and in some of the worst examples becoming a bright orange. Later examples include small amounts of grey, light blue, and yellow. In the older examples weavers sometimes created tiny jewel-like highlights by adding a few knots of white cotton or of coloured silk. The knot is almost invariably symmetrical. Knot density averages 1,400 to 1,500 knots per dm² but can range from a low as 900 to up to 2,500 knots per dm². As is the case with qarshıns there is no consistency in the structure of esikqas side finishes. The sides can be constructed from two, three, or four cords, each normally having a core of two warp threads. The warps are invariably wrapped with sheep's wool (z2s), which is mostly dyed either red or salmon pink or occasionally dark or light brown or blue. There is far more uniformity in the colour of esikqas side bands compared to qarshıns. The most common side wrapping is a uniform plain red or salmon pink, and only in a minority of cases does one encounter short sections wrapped with blue, beige, or brown. In most of these latter examples the additional colour tends to occur at one end, suggesting that the weaver had exhausted her supply of red wool. A few esikqas have completely brown or beige side finishes and one or two have no side wrapping at all, just a narrow selvedge of flat plain weave with the weft interlaced with several warps on each side. Most of the individual inventory records held by both the Savitsky and the Regional Studies museums in Karakalpakstan contain no more than the date of acquisition and the name of the owner from whom it was acquired. However a minority do contain additional facts that help us identify the approximate date of manufacture. At the Savitsky Museum the on eki mu'yiz esikqas 4702 was acquired in 1960 from Allambergen Xojambergenov of the Balg'alı clan, sub-clan Toqımbet, from Porlıtaw near Moynaq, who at that time was 60 years old. It was made by a woman called Nigarxan. If Nigarxan was his mother, the esikqas was probably woven before his birth in the late 19th century. The on eki mu'yiz esikqas 25392 was acquired in the Qon'ırat region in 1968. It was made by Ziybayda, who was born in 1882 and died in 1942, suggesting that it is very late 19th or very early 20th century. The esikqas of similar design, 25385, which appears to be much older, was purchased in the same year from Nurnazarov Sayıpnazarov of the Sheriwshi sub-clan from Kubıyshev sovxoz, Kegeyli region. He was born in 1924 and obtained the esikqas from his mother. We do not know if it was woven by his mother or his grandmother. All we can deduce is that it certainly predates 1924. 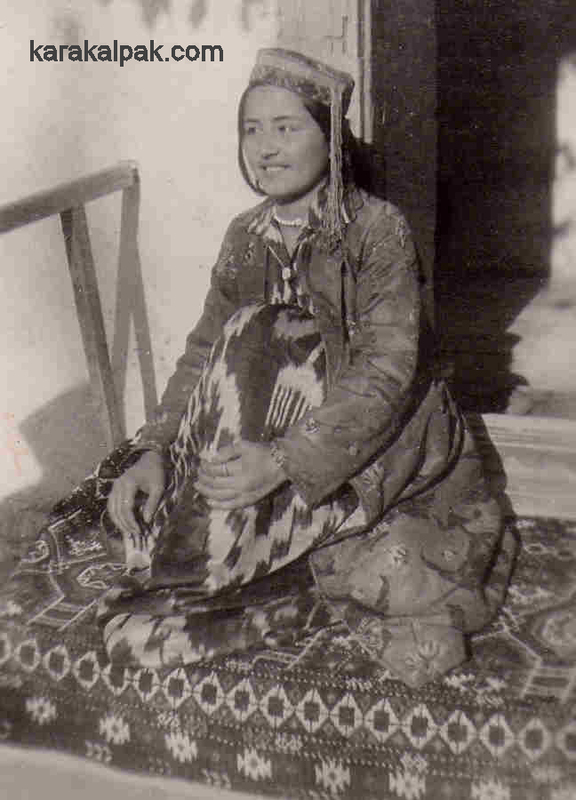 The qıyıq nag'ıs esikqas 3783 was obtained from Gu'layım Qosnazarova from Xalqabad, and had been made by her mother from the Teristamg'alı clan, who was born in 1864 and died in 1927. If she wove it for her marriage she probably made it no later than the early 1880s. Fortunately the provenance of collection of carpets assembled by Savitsky in 1958 destined for the State Museum of Oriental Art in Moscow was more rigorously recorded. Minor variant on eki mu'yiz esikqas 4273 was woven in 1907 and acquired from the weaver, while main variant on eki mu'yiz esikqas 4278 was also acquired from the weaver who was aged 70 in 1958, suggesting it was made in the early 1900s. An az mu'yiz esikqas 4313 described as a qarshın was woven by Danish Nazambetova from the Taraqlı tribe just before or just after 1900. A fragment of a similar esikqas, numbered 1614, was woven Zaliha Qozumbetova 60 years prior to 1957. A shaxmax nag'ıs esikqas 4282, described as geometric and composed of diamonds and squares with diagonal colouring, was woven by Ka'riyma Saylaxanova around 1900 to 1903. Finally a qıyıq nag'ıs esikqas 4283 was woven by Ayımxan Kuyukova from the Ton'moyın clan in 1907. Several on eki mu'yiz esikqas within the Richardson Collection can also be accurately dated. One was acquired from the son of Gu'layım, the daughter-in-law of the weaver Tomarys who was born in 1858 and wove the esikqas before her marriage when she was living in Zayır, a village to the west of Qazaqdarya, long since abandoned. It must have been made in the 1870s. Another was purchased from the weaver's grandson and was made in the late 1910s or the early 1920s. A third was made before 1925. Although sparse, this evidence suggests that these and many similar esikqas held in public and private collections were woven throughout the last quarter of the 19th century and the first quarter of the 20th century. All known pattern types seem to have been woven simultaneously over this period. There are four main pattern classifications, two of which have three minor variants making seven patterns in all. Approximate distribution of esikqas patterns. Two of these pattern types contain both major and minor variants. The main on eki mu'yiz pattern has two minor variants and the main shaxmax pattern has one. Therefore there are seven patterns overall. The on eki mu'yiz or twelve horns pattern is the most common type of esikqas. An on eki mu'yiz esikqas from the Richardson Collection. Probably early 20th century. in the minor variant there is a diamond-shaped array and no horns. From an analysis of 40 on eki mu'yiz esikqas, 85% fall into the main and 15% into the minor category. In addition there is one very rare form. The term on eki mu'yiz was used extensively by Beresneva although it never appeared in the earlier writings of Zhdanko or Esbergenov. 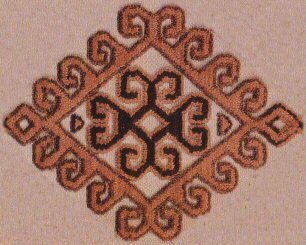 The only Karakalpak reference that Beresneva could find for this pattern was in Allamuratov's 1977 monograph on Karakalpak folk embroidery, where he described a similar embroidery motif as on eki mu'yiz. This suggests that the term is of Karakalpak origin. Allamuratov undertook many years of field work visiting female embroiderers throughout the delta and his terminology undoubtedly reflects local usage in the field of embroidery. 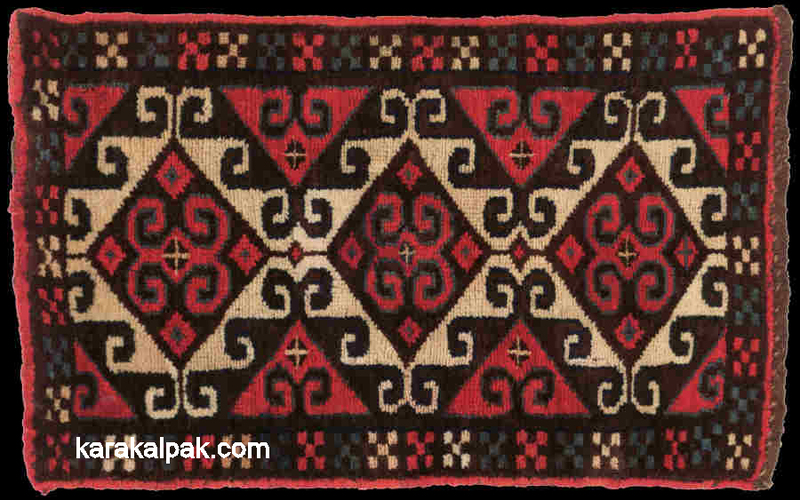 However Karakalpaks often applied different terms to the same design element depending on whether it was an embroidery motif or a carpet pattern. Amazingly no record exists to show what Karakalpak weavers called this carpet pattern themselves, even as recently as the 1930s. In the main variant the diamond-shaped motif sprouting the twelve horns is normally white or cream and sits against a brown background. It has a large brown diamond-shaped centre containing two symmetrically positioned pairs of curled horns, which are normally red, with a small centrally located diamond. An additional four small diamonds surround the curled horns, one on each side and one above and below. As there is no accepted Karakalpak phrase for "four horns" analogous to the Qazaq to'rt mu'yiz, we refer to the curled horns as jup mu'yiz, literally a pair of horns. Like many carpet motifs they can be viewed in two ways, depending on the orientation. Viewed sideways they appear as pairs of horns facing away from each other (called qos mu'yiz in Karakalpak), whereas viewed vertically they appear as pairs of horns facing or opposing each other (qarsı mu'yiz). Detail of an on eki mu'yiz esikqas from the Richardson Collection. Possibly late 19th century. The on eki mu'yiz motifs are always directly adjacent, only separated from each along their central axis by another small red diamond and at the top and bottom by a pair of larger opposing triangles, one inverted directly above the other. These are normally red and each contains a single pair of qos mu'yiz horns, coloured brown, and yet one further small diamond. All of the above motifs (on eki mu'yiz, jup mu'yiz, qos mu'yiz, and the triangle in which the latter sits) are outlined in a contrasting colour, often blue but sometimes also white, red, or a combination of these colours. However there is an alternative main variant on eki mu'yiz design in which the red and white colours are reversed, although the brown stays the same. Consequently the diamond with its twelve horns is red and the jup mu'yiz at its centre are white, as are the pairs of separating triangles. Only a minority of main variant patterns occur in this form (just over 5%). Alternative coloured variant of the main on eki mu'yiz esikqas design. Interestingly neither form contains any element of the diagonal colouring that is found in the majority of qarshıns and the other three main types of esikqas. However, as always, individual examples frequently contain elements that break the rules. Thus a weaver may have knotted all of her jup mu'yiz motifs in red wool apart from one that she has knotted in cream. Breaking the rules - detail of a main variant on eki mu'yiz esikqas. Image courtesy of the Karakalpak State Museum of Art named after Savitsky. Inventory number 5839. The number of repetitive on eki mu'yiz motifs included in a esikqas generally varies from five to eight, the most frequently occurring number being six. Most vary from five to seven, only two examples of eight having been identified so far. There is one example in the Savitsky Museum with just four motifs, but this is clearly a very non-traditional and late example (probably late 1930s) containing an unusually large amount of yellow wool. A short and excessively wide esikqas with just four on eki mu'yiz motifs. Note the synthetic red dye run. Image courtesy of the Karakalpak State Museum of Art named after Savitsky. Inventory number not recorded. Another small example, referred to above, with only three motifs has been published by Thompson. Neither of these latter two examples can be said to represent the traditional on eki mu'yiz esikqas. In one third of our sample the on eki mu'yiz esikqas contains a partial motif, indicating that the weaver had not pre-planned her work and simply stopped at the point where she felt her rug was wide enough for its purpose. The partial motif can be just one quarter, one half, or three quarters of the full motif and in all cases is accompanied by either five or six complete motifs. On eki mu'yiz esikqas usually have narrow end borders, often just a band of barber's pole colouring, and single side borders. In half of all cases the side border decoration is a repetitive row of pairs of horns, usually referred to as qos mu'yiz. In another quarter of cases it is a repetitive row of the geometric piskekshe, named after the crossed-shape beater that fits inside a butter churn or piskek. For the final quarter, side border designs vary enormously from the very simple to the complex. Almost all on eki mu'yiz esikqas have completely red or salmon pink selvedge cords. Out of the few exceptions, most have red combined with small amounts of grey, blue, beige, or brown. The minor variant on eki mu'yiz esikqas is identical to the major variant in every way except that the centrally located pairs of curled horns or jup mu'yiz are replaced by a geometrically shaped stepped diamond, containing one or more concentrically arranged stepped diamonds and in some cases a vertical cross at the centre. Sometimes the inner stepped diamond is divided into a chequerboard pattern with alternating colours across the squares. In other examples the outermost stepped diamond is almost stylistic, being only partially defined. The minor variant on eki mu'yiz esikqas with the stepped diamond centre. Image courtesy of the Savitsky Museum. Inventory number 3969. This stepped diamond motif is similar to the at ayıl nag'ıs motif used on horse's bellybands, but is referred to as tekshe nag'ıs or steps pattern by Aygu'l Pirnazarova, the Curator of Costume and Jewellery at the Karakalpak State Museum of Art named after Savitsky. The same term is used by Ag'ınbay Allamuratov to describe an identical stepped diamond embroidery motif. Minor variant on eki mu'yiz esikqas with stepped diamond centre and double side borders. Image courtesy of the State Museum of Oriental Art, Moscow. Inventory number 4273. One feature of the tekshe nag'ıs on eki mu'yiz pattern is that the colouring differs from that of the most common form of the main variant on eki mu'yiz pattern. 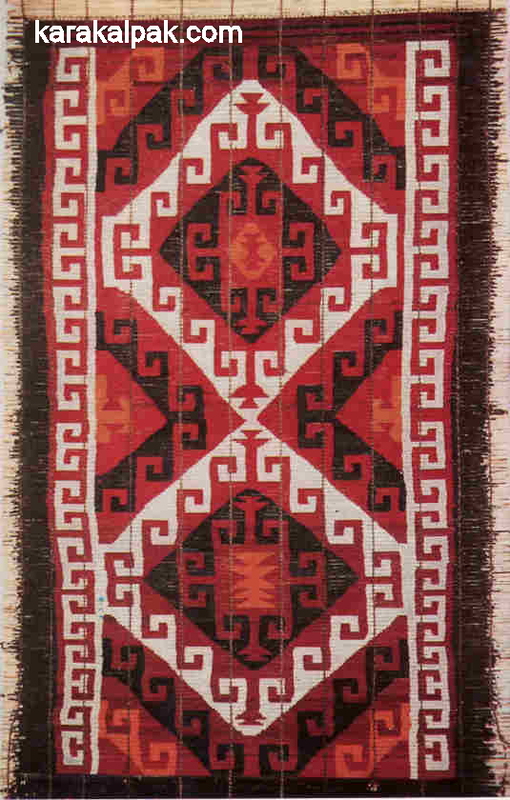 It is similar to that of the reversed colour form with red coloured twelve-horned diamonds sitting on a brown background, separated by white triangles containing brown qarsı mu'yiz motifs. The tekshe nag'ıs usually has a brown outermost stepped diamond, a red inner stepped diamond, and a smaller brown and red or cream and red innermost stepped diamond. However there are exceptions. A different version of a minor variant on eki mu'yiz esikqas from the Richardson Collection. The outer stepped diamond is red and the inner stepped diamond is red and white. Side borders again tend to be either repetitive rows of qos mu'yiz or piskekshe motif. Some examples, such as those illustrated above, were woven with two different side borders. Weavers find it hard to knot motifs with curved features and it is tempting to assume that this is a later variant of the traditional on eki mu'yiz pattern, developed as a short cut. There are certainly some synthetically dyed examples that appear to be more recent, possibly dating from the late 1920s or the 1930s. At the same time the appearance of other examples suggests that they could date from the turn of the century or earlier. If this pattern did emerge as a simplified version of the main variant on eki mu'yiz esikqas then it must have been during the 19th century. However our one final very rare version of the on eki mu'yiz pattern might suggest that the tekshe nag'ıs on eki mu'yiz esikqas has more ancient origins. Detail of the rare variant on eki mu'yiz esikqas from the Savitsky Museum, inventory number 4828. The main field contains a horizontal row of seven indigo blue diamonds with an outer border of small red and white crosses, creating a finely stepped outer diamond. Within each diamond is a lighter blue on eki mu'yiz motif, while in the triangular spaces between each diamond are a pair of opposing horns. Interestingly there are double side borders of barber's pole and piskeshe. This esikqas appears to be of 19th century origin and one wonders whether it might have provided some of the inspiration for the minor variant on eki mu'yiz pattern, the diamonds migrating from the outside to the inside of the on eki mu'yiz motif? In the opinion of Esbergenov the zoomorphic on eki mu'yiz pattern of esikqas is more closely associated with the former cattle-breeding northern Qon'ırat Karakalpaks than with the more agriculturally settled On To'rt Urıw. Certainly many examples are found from the northern delta, but others � such as those in Moscow collected by Savitsky in the Kegeyli region � show that they could be found just as frequently in the south. Of course many northern Karakalpaks were forced to move south throughout the 20th century as a result of changes to water levels and the desiccation of the Aral Sea. Following so much movement and intertribal marriage it is impossible to find any evidence today of a geographical bias in the distribution of this pattern. "whose pattern is regularly uniform, apart from insignificant variations in the border, for all localities and tribes of Karakalpaks in the regions of interest to us." Of course the on eki mu'yiz design was not restricted to the esikqas. Multiple-horned diamonds were used extensively on Karakalpak kergi storage bags and aq basqurs. A panel from a Karakalpak aq basqur decorated with on eki mu'yiz motifs. From the Richardson Collection. Note the similar layout to the on eki mu'yiz esikqas. The on eki mu'yiz pattern occurs frequently on aq basqurs and even smaller tent bands, one unique example being on an old and narrow iyin baw displayed in the Savitsky Museum, dyed with indigo and madder. It also occasionally crops up as a motif in both cross-stitch and chain-stitch embroidery, for example on the faces of both aq and qızıl kiymesheks. However the on eki mu'yiz pattern found on esikqas is quite different to that found on basqurs. It contains less diagonal elements and the horizontal and vertical outlines of the twelve-horn design are defined by straight rows of knots aligned along a limited number of specific warps and wefts. In other words it is easier to weave. We must remember that, unlike for the nomadic Turkmen, all-pile carpet weaving was a relatively minor craft for Karakalpak women compared to the production of tent bands and other yurt decorations. The main reason for this could be that the cattle-breeding Karakalpaks did not traditionally raise sheep in any significant numbers. Sheep are upland creatures which do not thrive in marshy environments. Although some Karakalpaks did raise some sheep (as evidenced by Kaulbars in 1873), these were bred for consumption and not for their wool. Even today the quality of Karakalpak sheep pelts remains extremely poor and the wool is unsuitable for weaving. Consequently the Karakalpaks had to source good quality sheep's wool from the neighbouring Qazaqs or Turkmen. Not surprisingly their knotted pile carpetwares were therefore much simpler in structure and design. One wonders if the particular form of the on eki mu'yiz esikqas pattern was developed by Karakalpak weavers so that they could make the most of their limited carpet knotting skills. As we show below, an almost identical on eki mu'yiz pattern appears on some Qazaq woollen patterned jez shiy screens where again it is far easier to produce a pattern delineated by horizontal and vertical lines. There also happens to be a second Karakalpak twelve-horned motif found on a fairly rare qarshın bag face where it is displayed within an octagon. It has similarities to both the kaikalak and the Memling gul and has been cumbersomely described as "the kaikalak variant of the Memling gul". We have classified it as the "Octagonal C" pattern. Interestingly this design is also outlined by horizontal and vertical straight lines. The Karakalpak on eki mu'yiz esikqas pattern is quite distinct and unmistakeable � it cannot be confused with any other Central Asian or Middle Eastern pattern. As we have seen in the section on dating, the pattern has remained almost constant since the 1870s, suggesting it must go back at least to the early 19th century. Perhaps its real origin is much earlier. As Beresneva pointed out in 1994, many other forms of the twelve-horned motif occur throughout Central Asia, not just on carpets but also in embroidery and wood carving. Indeed they can be found further afield in Afghanistan, Persia, the Caucasus, and Anatolia. It seems unlikely that these and other associated horn-like motifs appeared independently among the various neighbouring Turkic tribes and suggests that they have a common origin dating back to the time of the early nomadic Turks if not earlier. 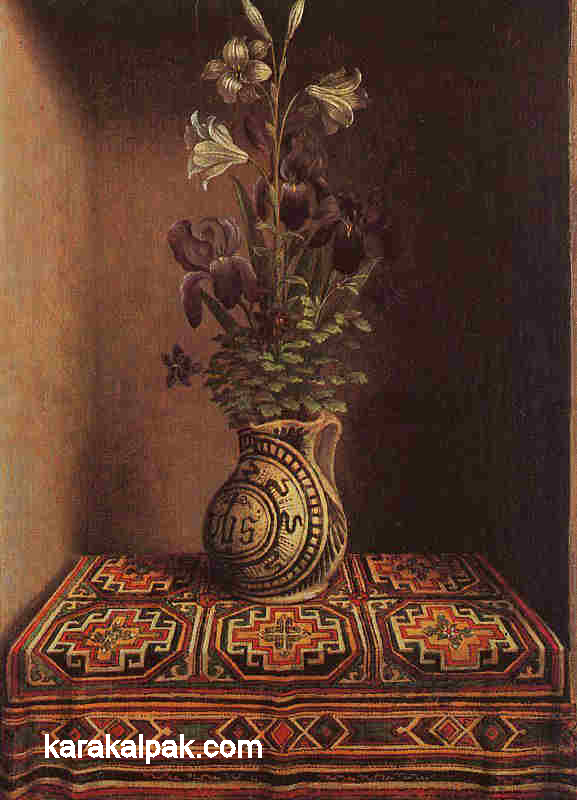 Still-life painted by Hans Memling, about 1490. This link is another indication of the antiquity of these horned motifs, confirming their presence in 15th century Europe. Multiple-horned diamonds occur frequently in Qazaq small carpets, storage bags, donkey saddle bags, and shiy screens, the number of horns ranging widely from 8 to 40 or more. Some shiy screen and door patterns are remarkably similar to the Karakalpak on eki mu'yiz design. 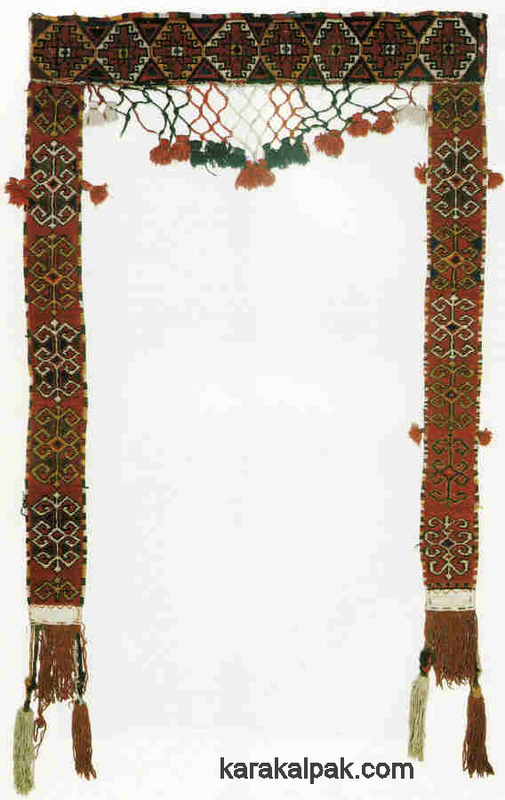 Decorated shiy door screen, known as a shum su, from Qizil Orda, western Kazakhstan. Decorated with 8- and 16-horned on eki mu'yiz-like motifs. From Mukanov, 1981. Shiy door screen from a Karakalpak yurt in Moynaq with an on eki mu'yiz pattern. The Kyrgyz make even more extensive use of the multiple-horned diamond, the twelve-horned version of which they refer to as the kochkorok or kaikalak pattern. 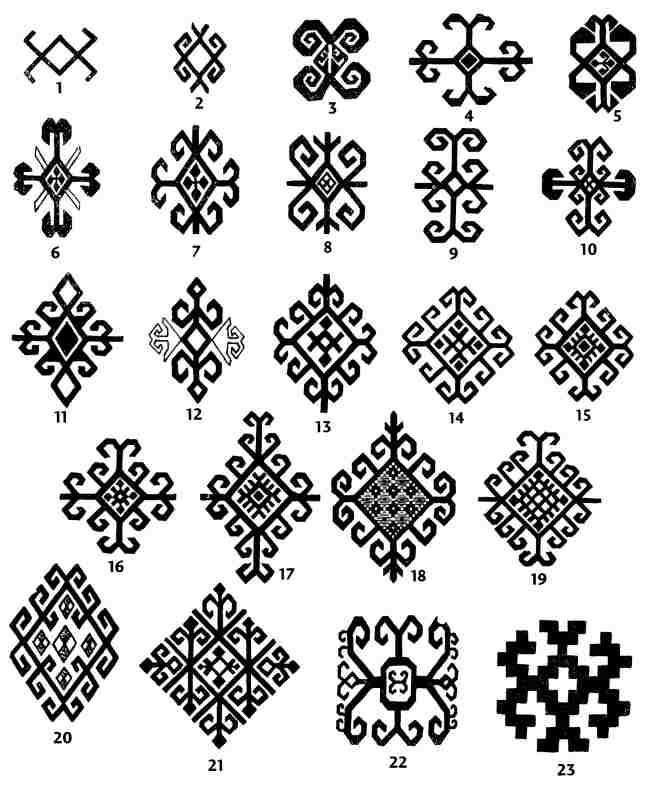 Examples of Kyrgyz horned diamond motifs. Figure 4.24 from Akmoldoeva and Sommer, 2002. In her 1968 review of Kyrgyz knotted pile carpets Antipina provides two references to the possible meaning of kaikalak, one suggesting that its meaning is "arched its back" and the other claiming that the kaikalak pattern is similar to the Central Asian pattern khaikel, meaning idol, image, or amulet. The Karakalpak ha'ykel is a large silver chest decoration worn by a married woman, which is also considered to have protective amuletic powers. Kaikalak motifs occur extensively on the knotted pile weavings of the southern Kyrgyz of the Ferghana region, appearing on small bashtyk bags, larger chavadan bag faces, and decorative tegerich tent bands. Most are depicted in the form of a diamond but a few appear as more rectangular Memling-like motifs. 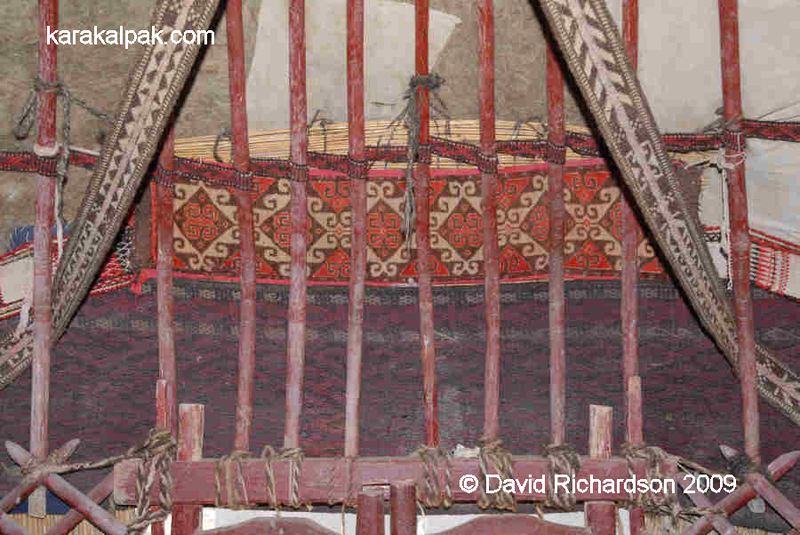 It also occasionally appears on Kyrgyz shiy reed screens although here the 8-horned version is much more popular. We should also note that the Uzbeks used similar kaikalak and kuchkorak motifs on napramach storage bags as well as on long-piled julkhir rugs. The frequent use of repetitive rows of three or four kaikalak motifs on the faces of Kyrgyz chavadan and Uzbek napramach storage bags underlines the likelihood that the Karakalpak on eki mu'yiz esikqas is derived from a qarshın-like bag. A Kyrgyz chavadan from the Karasu district of Osh region with three kaikalak motifs. From the State Museum of Oriental Art, Moscow, inventory number 8209, dated to the 1920s or 1930s. Complex variations of the twelve-horned motif are found among some but not all of the Turkmen tribes, including those who lived close to the Aral region in the 19th and early 20th centuries. Multiple hooked diamonds or dyrnak (claw) guls play an important part in Yomut carpet design. Twelve-horned versions occur in the form of the angular sekiz kelle (mysteriously named eight heads) gul on their storage bags and as sekiz gochak (literally eight horns) on the large carpets. It seems that the Turkmen are not fussy about the exact number of horns that appear on their segiz kelle motifs, which may be why they are also frequently referred to as Memling guls. Both the Chodur and the Igdir used similar eight- and twelve-horned motifs in their chuval bag faces, which they named kirk shokh or kirk buinez (literally forty horns). Some are Memling-like while others resemble a horned or hooked diamond. 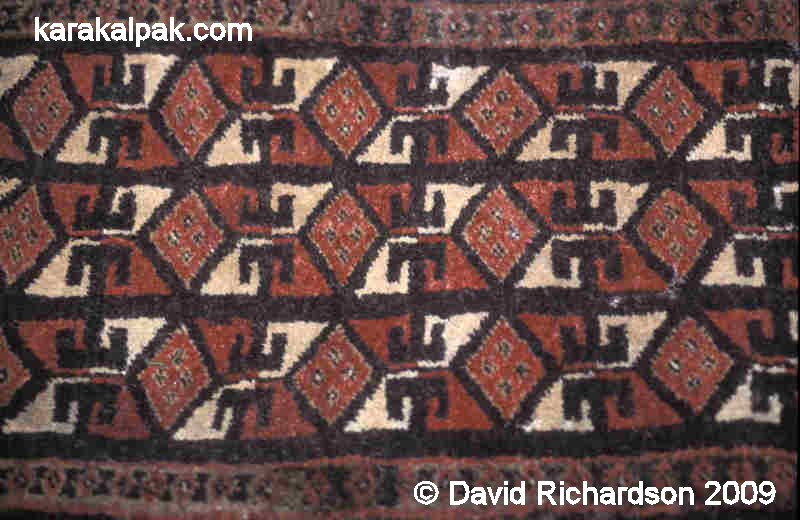 The Tekke too have their own versions of the dyrnak, sekiz kelle, and sekiz gochak guls all of which tend to be used as secondary motifs in large floor carpets. The az mu'yiz nag'ıs or small horns pattern esikqas has a very geometric design. The central field consists of three parallel rows of square-shaped diamonds, linked horizontally. These usually contain four much smaller diamonds positioned in each corner although in some renditions these are replaced by a cross and in others the diamond is segmented into quadrants. The spaces in between the diamonds are filled with two pairs of rectangular horns facing each other head to head on a background of two contrasting colours � normally red and white � arranged so that they match diagonally. Three az mu'yiz esikqas displayed in the old Savitsky Museum in 1999. The three rows are separated by narrow horizontal bands usually decorated with a barber's pole design and in other cases with simple piskekshe, saw tooth, or railway line designs or sometimes with just a solid line. 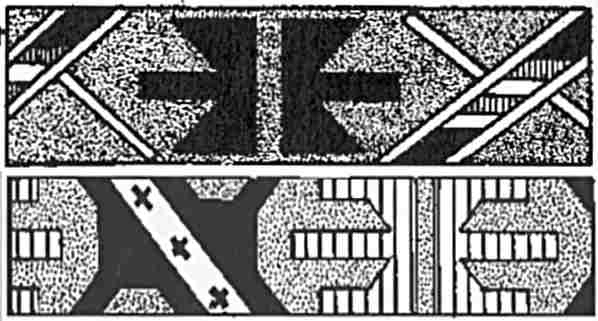 Side borders can be single or double and tend to be also geometric with rows of T-shapes, diamonds, squares, chevrons, or the interlinked џ-shaped tuning-fork motif similar to the Turkmen soldat (soldier) border pattern also referred to as ok gozi (small arrow). There appear to be two colour forms for this esikqas. The most common form is brown, white, and either red or pink. Brown, white, and red az mu'yiz esikqas. From the Karakalpak State Museum of Art named after Savitsky, No'kis. The rarer form is a most unusual combination of brown, pistachio green, and pink. The rarer brown, pistachio green, and pink az mu'yiz esikqas. From the Richardson Collection. Acquired with ishki janbaw attached. The pistachio colour must have come from a local natural dye because it was frequently used in other Karakalpak yurt decorations. Interestingly Zhdanko described her early impression of the exterior decoration of the Karakalpak yurt in her 1952 article as being of a predominantly pinkish brown nuance with the addition of pistachio green and golden yellow tones. In regard to terminology we are unaware of any traditional Karakalpak name for this esikqas pattern and have mutually agreed to use the term az mu'yiz (small horns) in our numerous discussions with Aygu'l Pirnazarova, the Curator of Costume and Jewellery at the Savitsky Museum. From the Russian Ethnography Museum, Saint Petersburg, inventory number 7128-53. 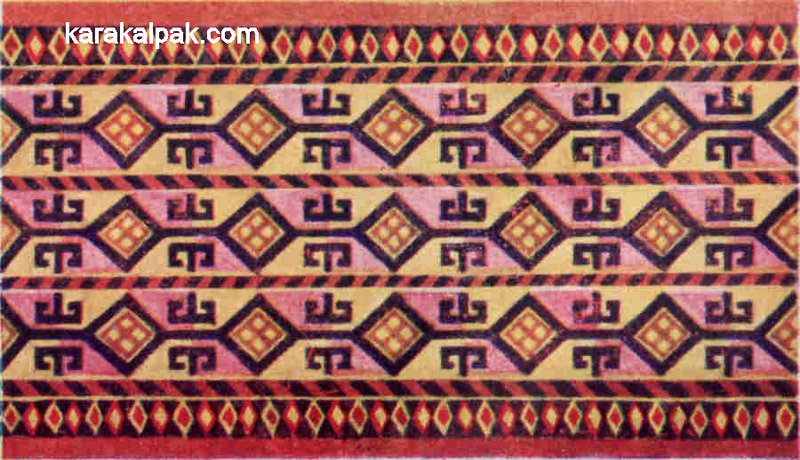 The pattern appears to be similar to certain border designs used by Turkmen weavers and is very close to a pattern found on strips of Uzbek alacha, which are sewn together side to side to make flat-woven alacha carpets and decorative yurt wall hangings, sometimes called pallas, a another term of Uzbek origin. Moshkova illustrated it as one of the unnamed patterns found in Uzbek flat-woven rugs woven using the gajari warp substitution technique (her Plate VII), and as kuchkorak kashta for rugs woven in the besh kashta technique, literally five or five-fold embroidery, a discontinuous supplementary weft brocading technique where the warps are twined around thicker weft threads thus creating the impression of embroidery (her Plate IX). The kuchkorak kashta pattern (literally "strong patchwork embroidery pattern") from Moshkova's Plate IX. In this version the horns face outwards instead of inwards. 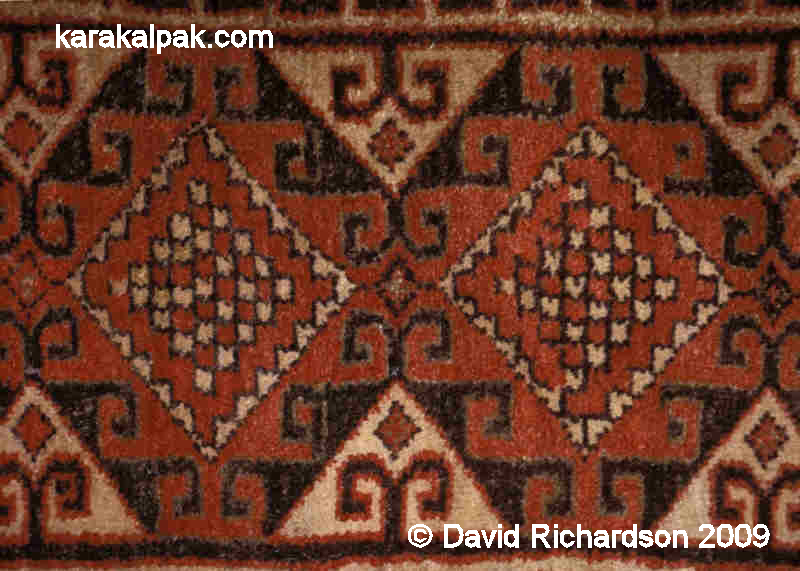 The Karakalpaks made very similar flat-woven carpets, which they call alasha, incorporating very similar motifs. 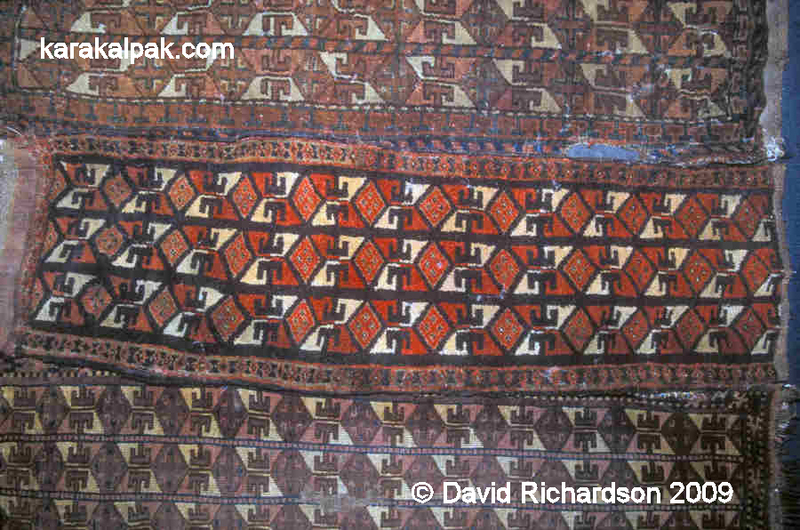 Having only inspected about half a dozen Karakalpak alasha carpets ourselves we have not so far identified this specific pattern but see no reason why it should not have been within the Karakalpak repertoire. There is a somewhat similar Karakalpak motif in which two pairs of angular horns project from opposite sides of a small square-shaped diamond. This is called bawırsaq mu'yiz, named after the small triangular pastry served at weddings and other celebrations. While on the subject of motifs, the diamond with four spots that occurs in this pattern is called wolf's eyes or in Karakalpak bo'ri ko'z. We have already mentioned that the provenance of the Moscow collection of esikqas shows that this pattern was certainly being woven at the turn of the 19th century and probably during the 19th century on the basis that one further example, inventory number 1624, is most likely even older. An az mu'yiz esikqas from the State Museum of Oriental Art, Moscow. Inventory number 1624, claimed to be 19th century. Certainly Melkov encountered the same pattern in 1929 but in the form of a complete qarshın bag. A later example painted by Andrianov in the Kegeyli region in 1947 was also described as a qarshın. B. V. Andrianov and A. S. Melkov described this esikqas as a qarshın. From Baxıtlı kolxoz, Kegeyli region, 1947. Reproduced from Works of the Khorezm Expedition, Volume 3. We have already shown that Andrianov may have been confused about the distinction between qarshıns and esikqas. However there can be no confusion about Melkov's photograph. It is clear that in the early 20th century some Karakalpak weavers used the az mu'yiz design on a small number of qarshın bag faces. The shaxmax nag'ıs esikqas has an entirely abstract geometric design with an almost contemporary feel. The central field consists of a matrix of parallel rows of rectangles (or sometimes squares), each rectangle containing a diamond which in turn contains another rectangle. The number of rows is normally four, although a few examples have three and others have four and a half. Each rectangular cell in the matrix is bisected both vertically and horizontally by additional narrow lines, segmenting it into quadrants. The quadrants of the innermost rectangles and the triangular corners of the outermost rectangles are then coloured either red or brown (or some other pair of contrasting colours), the colours being arranged so that they match symmetrically across the diagonal. The side borders differ widely and include barber's pole, rows of T-motifs, piskekshe, and qos mu'yiz. Some have no side borders at all. In many the side border continues around the ends but others have different decorative end borders that can be narrow or wide, while some have no end border at all. Side edgings are generally but not exclusively red. A naturally dyed shaxmax nag'ıs esikqas with stepped diamond side borders and wide end borders. Inventory number 4314, mounted on black velvet. Image courtesy of the Karakalpak State Museum of Art named after Savitsky, No'kis. A long shaxmax nag'ıs esikqas with narrow borders, inventory number 5071. The colour palette of these esikqas is normally brown or black and red and white, in many cases along with beige or cream and/or grey, light blue, or dark blue. Blue seems to be missing in all the later examples. In a minority of examples the quadrants of the innermost rectangles contain small contrasting dots. In one old example the triangular corners of the outermost rectangles contain small contrasting coloured triangles. Again there is no known Karakalpak name for this pattern and we use the descriptive term shaxmax, meaning chequered. In Karakalpak shaxmat means chess and shaxmatlap mean in chessboard order or with staggered rows as in a chessboard arrangement. The term shatırash, which is used by Karakalpaks to describe finely chequered bo'z, actually means crossed and is therefore not such an appropriate description. Two shaxmax nag'ıs esikqas from Kegeyli region, inventory numbers 4282 and 1615. The first woven around 1900 to 1903 and the second attributed to the early 20th century. However an example in the David and Sue Richardson Collection is much older, possibly made in the first half of the 19th century. It is interesting that this early example was woven in the north-western part of the Aral delta. An old shaxmax nag'ıs esikqas from the former village of Aq Darya in Moynaq region. From the Richardson Collection. Probably first half of the 19th century. Another example was painted by the Khorezm Expedition in 1947. Andrianov and Melkov describe this as the ornament of a qarshın rug woven in the raised pile technique. Painting of a section of a shaxmax nag'ıs esikqas by Andrianov, described as a qarshın. From "Chapaeva" kolxoz, Kegeyli region, 1947. Illustrated in Works of the Khorezm Expedition, Volume 3. 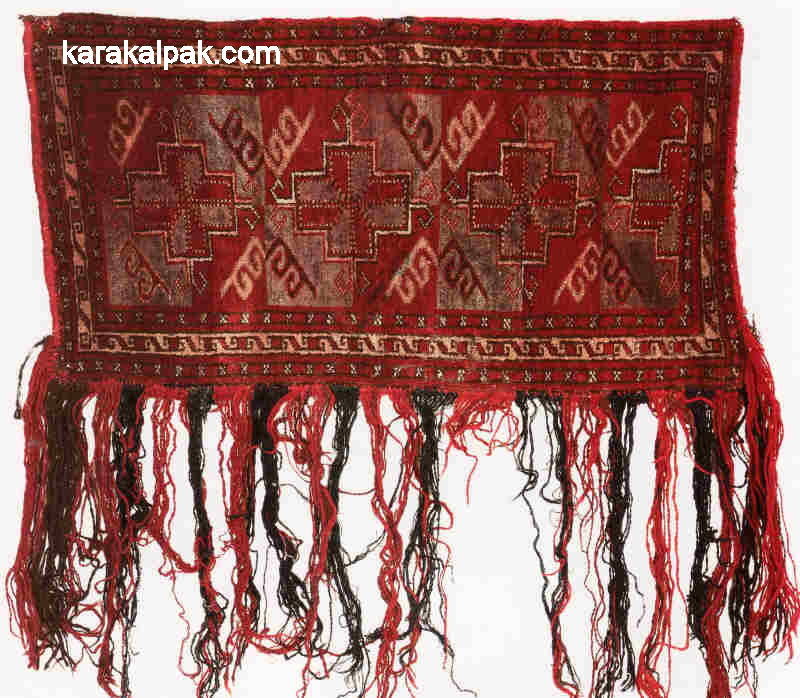 It is not clear whether the weaving was from an actual qarshın or was mistakenly described as such. We have so far never encountered a qarshın bag decorated with this pattern in our researches. Once again the rows of this pattern are very similar to the border designs found on certain Turkmen Chodor rugs and bag faces. 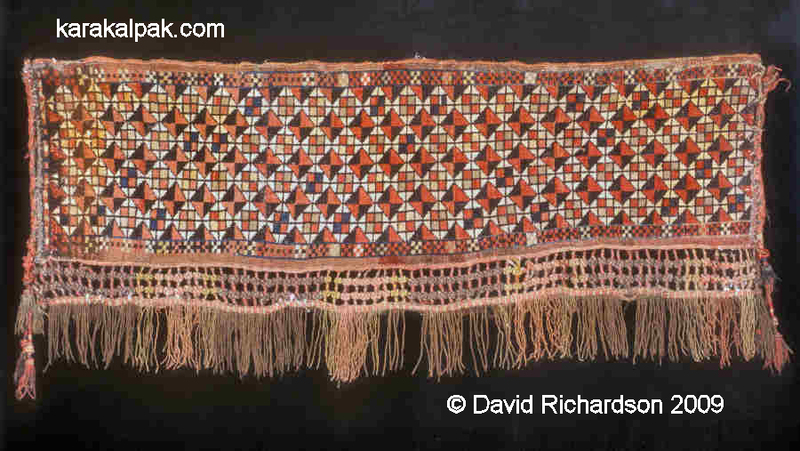 Chodur weaving from the Charles Grant Ellis Collection, said to be an early 19th century bridal camel trapping. From Mackie and Thompson, 1980. Chodur torba from the Turkmenistan National Carpet Museum, assigned to the late 19th century. From O'Bannon's translation of Moshkova, 1996. Girl, possibly Karakalpak, sitting on a knotted pile rug with a shaxmax border design. Image courtesy of the Karakalpak State Museum of Art named after Savitsky, No'kis. Late 1920s or 1930s. The influence of the Chodor can be gauged from the following painting of a Karakalpak kergi storage bag, painted by a member of Melkov's expedition in 1928-29.
with four ortmen gul medallions. Image courtesy of the Regional Studies Museum, No'kis. During the 19th century the Chodur were located along the western edges of the Aral Delta in the vicinity of the Quwanısh jarma, which flowed north from Xojeli to Qon'ırat. According to Moshkova they were more likely than the other Turkmen groups to engage in mixed marriages with the other surrounding non-Turkmen tribes. Although Moshkova only mentions the Qazaqs, it is likely that they also intermixed with the Karakalpaks who Butakov noticed were more prosperous than the Qazaqs in this region during the 1850s. The gridless shaxmax nag'ıs esikqas, inventory number 4606. As such it appears as a diagonal lattice of diamonds, with the diagonal colouring limited to the whole diamonds rather than to any component parts. The pattern has narrow railway line end borders, no side borders, and red side finishes. The qıyıq nag'ıs esikqas seems to be the rarest of the four main types of esikqas. Qıyıq nag'ıs means diagonal or bias pattern. Ludmilla Beresneva referred to it as kiyik, which is actually the Karakalpak name for a deer. Qıyıq/kiyik is a classic example of the misunderstandings that arise when Karakalpak words are translated into English via Russian, which does not have all the Cyrillic characters of Karakalpak. The Karakalpak word қыйық meaning diagonal would normally transliterate as кыйык in Russian, the equivalent of kyyyk in English. Beresneva found it difficult to translate it exactly and expressed it as кыйик in Russian, the equivalent of kyyik. Because of the impossibility of having two consecutive letter "y"s, the word is transliterated into English as kiyik, which means deer. An old qıyıq nag'ıs esikqas, inventory number 3783, probably made in the early 1880s. It was woven by a woman from the Teristamg'alı clan (Qon'ırat arıs), who was born in 1864 and died in 1927. A qıyıq nag'ıs esikqas from Kegeyli region with one missing side border. 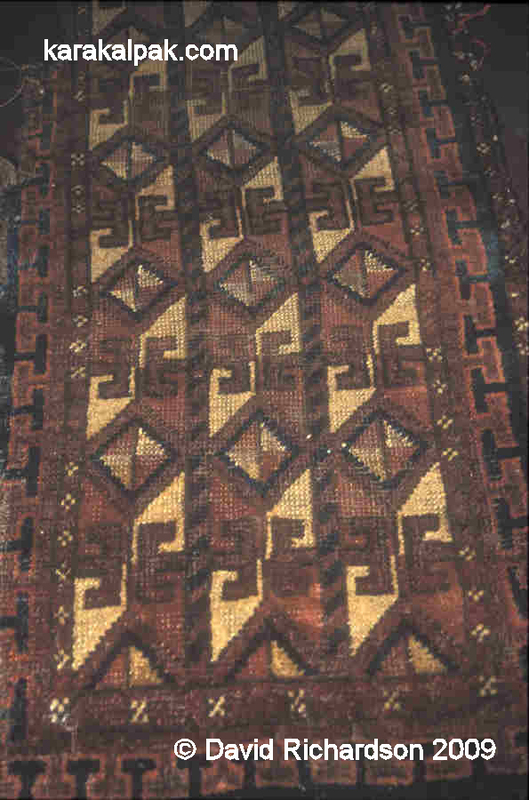 Woven by Ayımxan Kuyukova from the Ton'moyın clan (On To'rt Urıw arıs) in 1907. Image courtesy of the State Museum of Oriental Art, Moscow. Inventory number 4283. The qıyık nag'ıs design consists of three or four parallel rows of angular geometric motifs. Each row consists of pairs of angular Y-shaped figures, one inverted alongside the other, positioned between X-shaped figures somewhat similar in shape to the turquoise glazed tile inserts used on Khorezmian (and Bukharan) mosques and minarets during the time of the Golden Horde. Each row is sandwiched in between two narrower rows of barber's pole, small diamonds or џ-shaped tuning fork motif analogous to the Turkmen soldat motif. This central field is then surrounded by an outer border of qos mu'yiz, piskekshe, or small diamonds. A qıyıq nag'ıs esikqas from the Richardson Collection. A qıyıq nag'ıs esikqas with four rows of motifs. Image courtesy of the Regional Studies Museum, No'kis. Inventory number 1926. One special feature of this pattern is that it contains a significant amount of both dark and light indigo blue. The qıyıq nag'ıs pattern only seems to occur on esikqas. To date we have never found this pattern associated with a qarshın. The ashik border pattern, Saryk above, Yomut below. Extracted from Moshkova, 1970, Plates XLI and LXIV. Ersari main carpet with the darak border pattern. 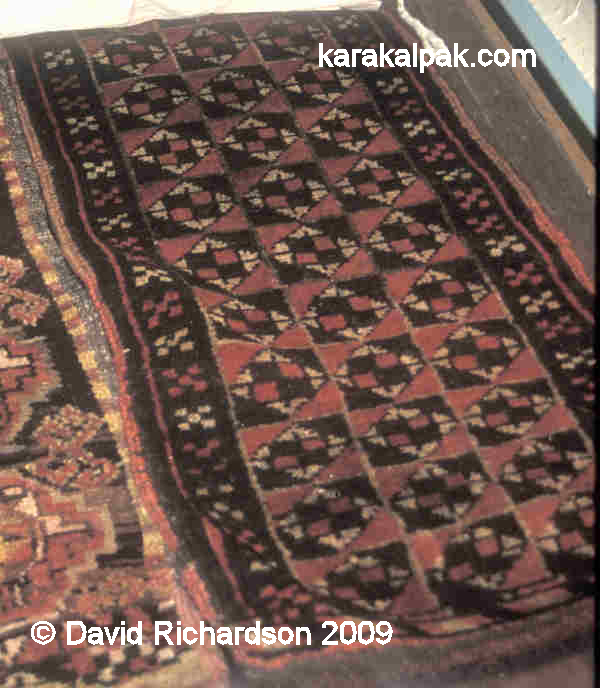 The implication is that this Karakalpak pattern too was inspired by contact with the neighbouring Yomut Turkmen. We have only come across one example of a so-called "combination technique" esikqas � in the State Museum of Oriental Art in Moscow, inventory number 4290a. It has a woven white cotton ground with a partially knotted pile pattern of "cross-shaped rosettes with a central diamond" set against the plain ground. It was undoubtedly used as a esikqas because it still has an attached pair of ishki janbaw (4290b and c). Unfortunately no image of this item is available. This is an improvised esikqas that was not specifically woven as a door decoration but was cut-out of a length of old aq basqur, the cut ends being edged with jiyek by means of loop manipulation. The use of old basqurs to make floor rugs and storage bags seems to have been a common practice in the 1930s and beyond, but this is the only example that we have seen where a length of aq basqur has been used as a substitute for a esikqas. in Kegeyli region in 1958. From the State Museum of Oriental Art, Moscow. Inventory number 4289. The somewhat similar Moscow item 4289 is described as a carpet made from three strips of qızıl qur and an esikqas. It is actually a small pallas carpet made from strips woven in so-called combination technique. They are neither qızıl qurs nor an esikqas. The widest component is one half of a pair of shiy on'ir, the decoration used externally on either side of the outer yurt door. The original purpose of the three narrower strips is a mystery. They are not aq qurs, nor are they part of the band that runs around the lower edge of the roofing felts, since neither of these external weavings was ever decorated in combination technique. 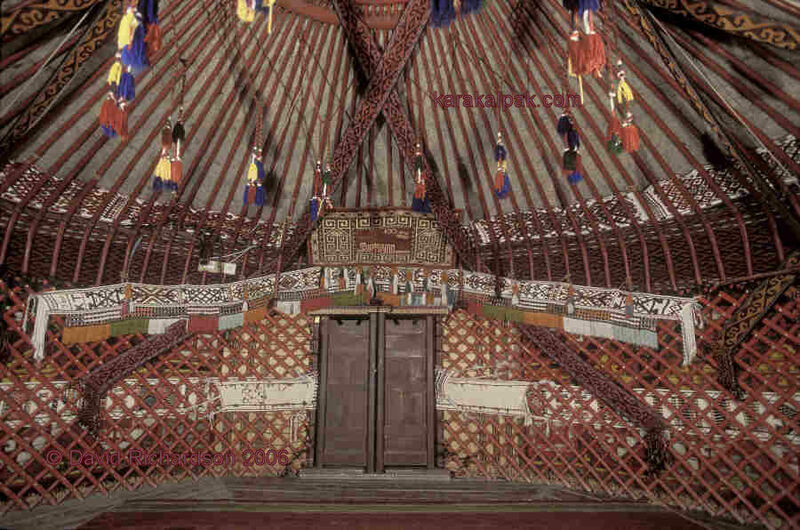 The practice of decorating the space above the interior yurt door with an esikqas is a long-standing tradition followed by Karakalpaks throughout the Aral Delta. Although we can only establish that the fashion was followed from the 1870s onwards, it must date from an earlier period. At the same time it seems unlikely that the esikqas has an ancient origin. 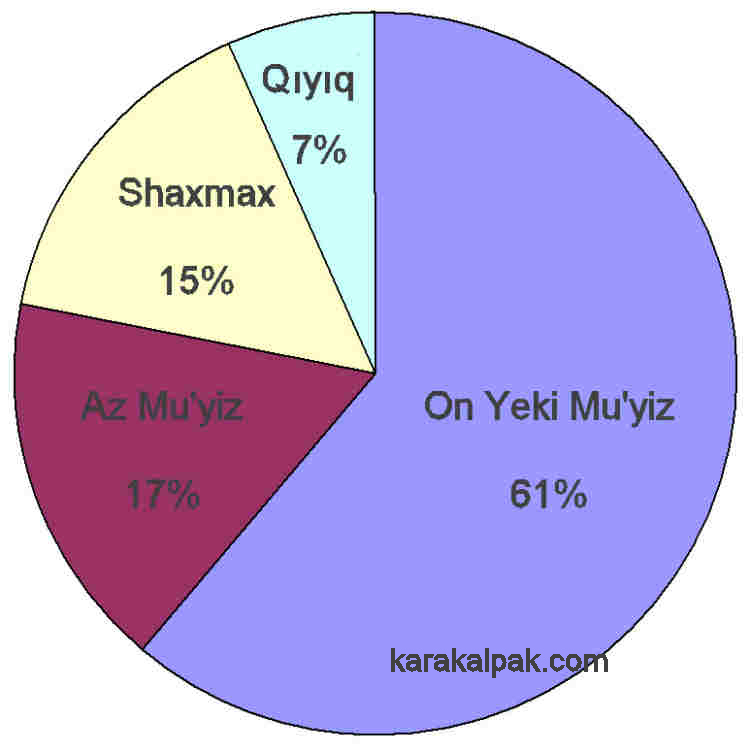 The comparable size of the on eki mu'yiz esikqas to the Karakalpak qarshıns and their identical structure, coupled with the similarity of their design to Uzbek napramach and Kyrgyz chavadans, plus the continued existence of qarshıns bearing the on eki mu'yiz and az mu'yiz patterns all suggest that the esikqas evolved from a bag face. We surmise that at some time in the past a wealthy bey � probably from the Qon'ırat arıs - decided to decorate the space above his yurt door with a bag face. The fashion caught on and became widespread. As Karakalpak standards of living began to improve in the late 19th century it was not long before most yurt owners had their own esikqas. The fashion was even copied by the surrounding Qazaqs and maybe Aral Uzbeks. The development of the esikqas might have also led to evolution of the internal or ishki janbaw. Obviously the on eki mu'yiz pattern itself has ancient Turkic roots. 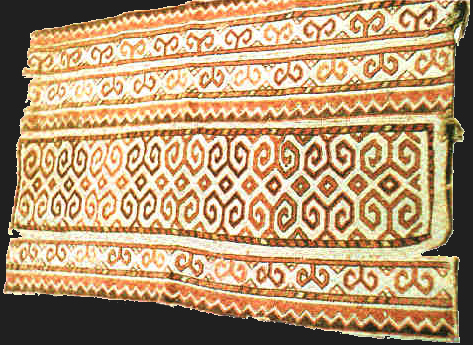 The discovery of a carpet described as an accurate copy of the Aral Karakalpak on eki mu'yiz esikqas among the Karakalpaks of the Samarkand region could mean that this design of esikqas dates back at least to the late 17th or early 18th centuries and probably earlier. However this does not seem to be the case for the other three major esikqas patterns � az mu'yiz, shaxmax nag'ıs, and qıyıq nag'ıs � all of which seem to have been inspired by border patterns in Turkmen storage bags and rugs. 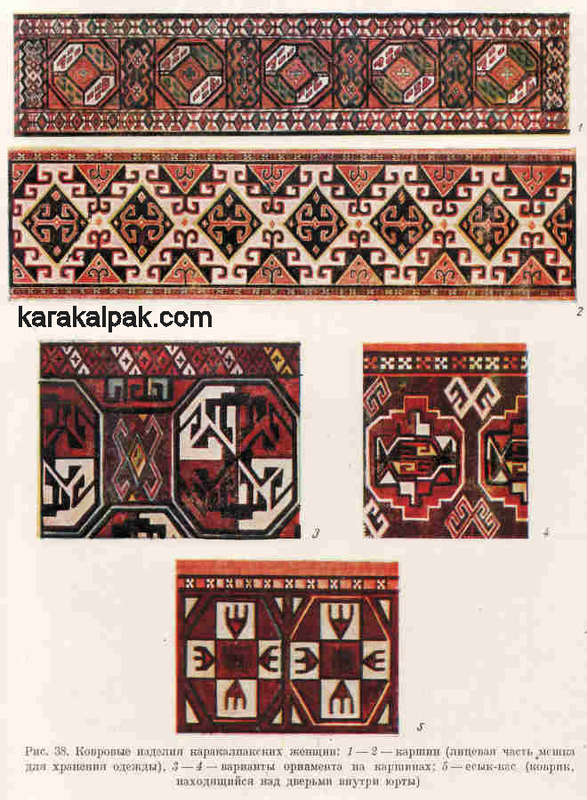 If the Turkmen were indeed the inspirational source of these patterns they can only have emerged in Karakalpak weaving during the 18th and early 19th centuries following the main Karakalpak migration into the western part of the Aral Delta. Of course the Karakalpaks had a difficult time with the neighbouring Turkmen tribes. They were frequently raided by the Turkmen and not only suffered the loss of their property and livestock but also the kidnapping of their wives and children. However in certain regions some groups of Karakalpaks lived harmoniously alongside their Turkmen neighbours. 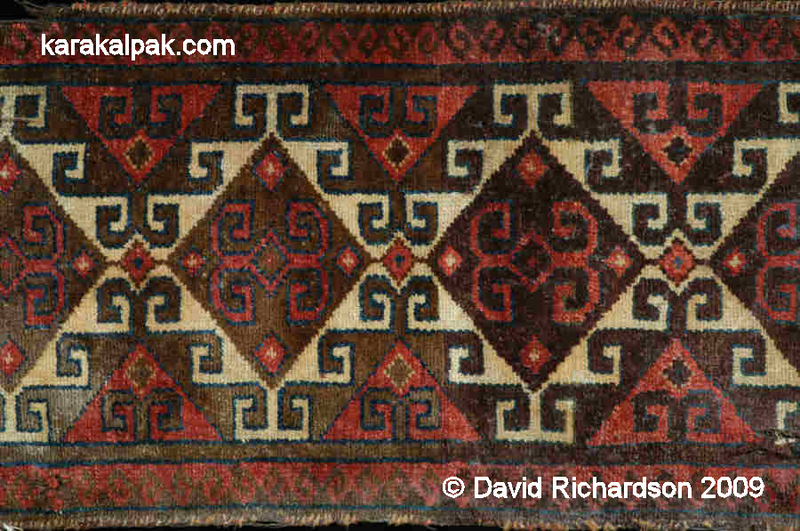 The subsequent intermarriage of Karakalpaks and Yomut and Chodor Turkmen may have encouraged some Karakalpak weavers to adopt Turkmen patterns (and possibly vice versa). One obvious feature of the patterns that appear on Karakalpak esikqas is that the designs all seem to have been adapted for relatively easy knotting. Each pattern is delineated horizontally by specific pairs of warps, vertically by specific wefts and diagonally by the natural angle determined by the interwoven warp and weft. For example, in a plain-woven textile with the same number of warps and wefts per cm, the diagonal of the weave would be 45 degrees. However in the case of symmetrically knotted carpets each knot is tied across two adjacent warps and sandwiched between two wefts. At the same time the warp density is generally higher than the weft density. The net result is that in most esikqas the pattern diagonals are angled at around 55 degrees from the horizontal. We have already noted that, unlike the Turkmen, Karakalpak weavers spent a relatively small amount of time making all-pile carpet items. They did not produce their own sheep's wool and did not have access to the large frame ground loom. They were none the less competent dyers and weavers and despite the limitations imposed by the crude o'rmek loom produced some powerful small weavings with wonderful natural dye palettes and elegant uncluttered designs. Finally it is apparent that the distinction between Karakalpak esikqas and qarshıns is not clear cut. Although more than 90% of esikqas are used to decorate the yurt door and over 95% of qarshıns are used as bag faces, in a minority of cases their roles are reversed. Having said this, the most frequent crossover in roles relates to esikqas being used (or described) as qarshıns. This does not seem to be the result of the decay of traditional Karakalpak culture under Soviet rule � the practice clearly predates the Soviet era. It more likely reflects the fact that esikqas evolved from qarshın bag faces. While the majority of Karakalpaks adopted the fashion of decorating their yurt door with an esikqas, reserving a proscribed number of qarshın patterns specifically for that purpose, a minority continued to make storage bags using the old designs. There is only one museum in the world that has a comprehensive selection of esikqas on public display - the new Karakalpak State Museum of Art named after Igor Savitsky, located in the centre of No'kis, the capital of Karakalpakstan. No'kis is very easy to visit on a day trip by road from Khiva. The Museum is friendly and several staff speak English. In the past we have always recommended that while in No'kis people also visited the nearby Karakalpak Regional Studies Museum which was within walking distance of the Museum of Art. Unfortunately that museum closed in December 2010. A new city centre location is planned for it in 2012. For detailed information on visiting both of these museums see our Sightseeing page. Andrews, P. A., The Turkmen Tent, in Turkmen Tribal Carpets and Traditions, pages 39 to 59, The Textile Museum, Washington, 1980. Andrianov, B. V., and Melkov, A. S., Forms of Karakalpak Peoples Ornament [in Russian], Works of the Khorezm Archaeological-Ethnographical Expedition, Volume III, Materials and Research on Karakalpak Ethnography, pages 411 onwards, Academy of Sciences, Moscow, 1958. Antipina, K. I., Portable Dwellings [Yurts], The Kyrgyz and their Reed Screens, pages 59 to 80, John L. Sommer, Freemont, 1996. 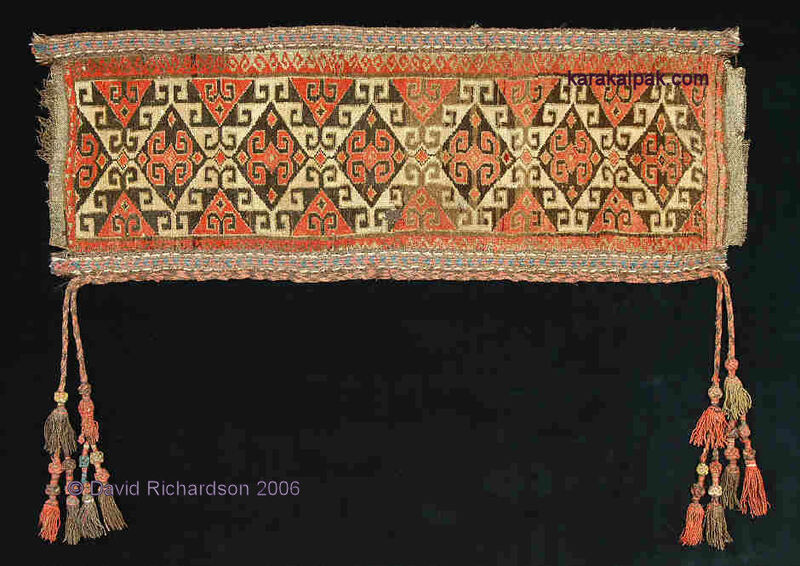 Antipina, K. I., Pile Woven Carpets, Klavdiya Antipina: Ethnographer of the Kyrgyz, pages 210 to 227, John L. Sommer, Freemont, 2002. Beresneva, L. G., Karakalpak Carpet Wares [in Russian], The State Museum of Oriental Art, Moscow, 1994. Beresneva, L. G., The Kyrgyz Carpet II: The Kyrgyz Carpet Collection, State Museum of Oriental Art, Moscow, page 59, George W. O'Bannon, Tucson, 2000. Emelyanenko, T., The construction and decoration of the yurt: doors and lintels, in Music for the Eyes: Textiles from the Peoples of Central Asia, pages 81 to 90, Hessenhuis, Antwerp, 1997. Ivanov, S. V. and Antipina, K. I., The Popular Applied Ornamental Art of the Kyrgyz People [in Russian], Works of the Kirghiz Archaeological-Ethnographical Expedition, Volume 5, Science, Moscow, 1968. Karazin, N. N., In the Lower Reaches of the River Amu: Travel Descriptions [in Russian], Herald of Europe, Book 3, Saint Petersburg, 1875. Kaulbars, A. V. Lower reaches of the river Amu-Darya, described in his own studies in 1873 [in old Russian], Notes of the Russian Geographical Society, Saint Petersburg, 1881. Moshkova, V. G., Carpets of the Peoples of Central Asia [in Russian], Published by Fan, Uzbek SSR, Tashkent, 1970. Moshkova, V. G., Carpets of the Peoples of Central Asia, edited and translated by O�Bannon and Amanova, Published by George O'Bannon, Tucson, 1996. O'Bannon, G., Karakalpak Rugs, in Carpets of the Peoples of Central Asia, pages 102 to 105, George W. O'Bannon, Tucson, 1996. Pinner, R., The Rickmers Collection: Turkoman Rugs in the Ethnographic Museum Berlin, Staatliche Museen zu Berlin, Berlin, 1993. Schneider, E. R., Kazakh Ornament [in Russian], in "Kazakh: Anthropological Essays", S. I. Rudenko, Leningrad, 1927. Thompson, J., Timbuktu to Tibet, Exotic Rugs & Textiles from New York Collections, Hali Publications, London, 2007. Tlewbergenova, N., A propos des habitations Karakalpaks, in Karakalpaks et autres gens de l'Aral [in French], Published by EDISUD, Tashkent/Aix-en-Provence, 2002. Tlewbergenova, N., Ethnocultural Aspects of the Karakalpak Yurt [in Russian], Bulletin of the Academy of Sciences, Number 2, pages 104 to 109, No'kis, 1995. Tolstov, S. P., Zhdanko, T. A., Abramzon, S. M., and Kislyakov, N. A., People of Central Asia and Kazakhstan [in Russian], People of the World, Moscow, 1962. Tsareva, E., Rugs & Carpets from Central Asia: The Russian Collections, Allen Lane/Penguin Books, Harmondsworth, 1984. Zhdanko, T. A., The Way of Life in a Karakalpak Collective Farm Village [in Russian], Soviet Ethnography, Issue 2, pages 35 to 58, Academy of Sciences of the USSR, Moscow, 1949. Zhdanko, T. A., Work of the Karakalpak Ethnographical Force in 1956 [in Russian], Field Studies of the Khorezm Expedition in 1954 � 1956, Publishing House of the Academy of Sciences of the USSR, Moscow, 1959. This page was first published on 6 April 2009. It was last updated on 6 March 2012.